Welcome to acuteFX Design's portfolio where we're showcasing some of our favourate and most recent design work. Here you can find examples of our website design and graphic design, identity design, business card templates, print work, photo restoration and photo manipulation. You can click on a project's thumbnail to view larger images and use the links to the left to navigate to specific project types. 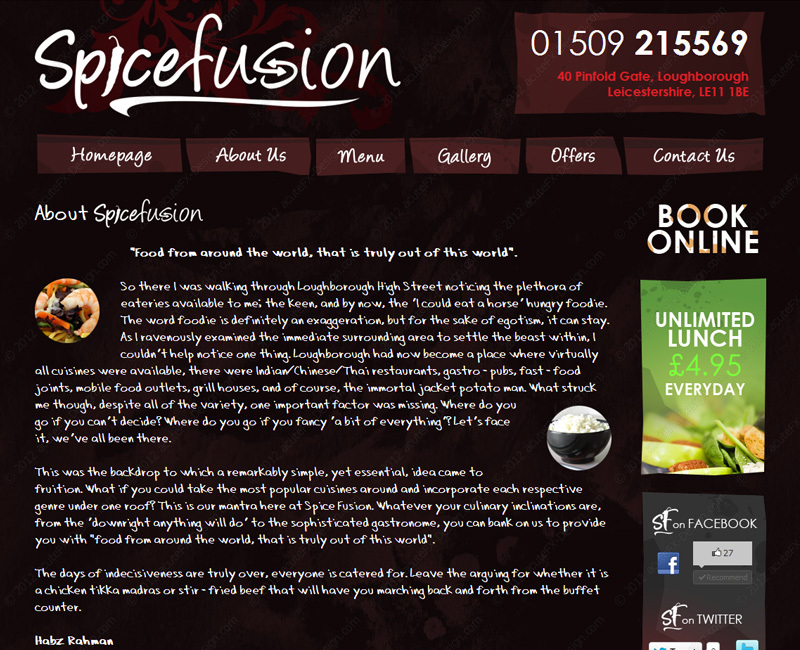 Spice Fusion came to acuteFX Design looking for a quick turn-around on a modern and stylish website. 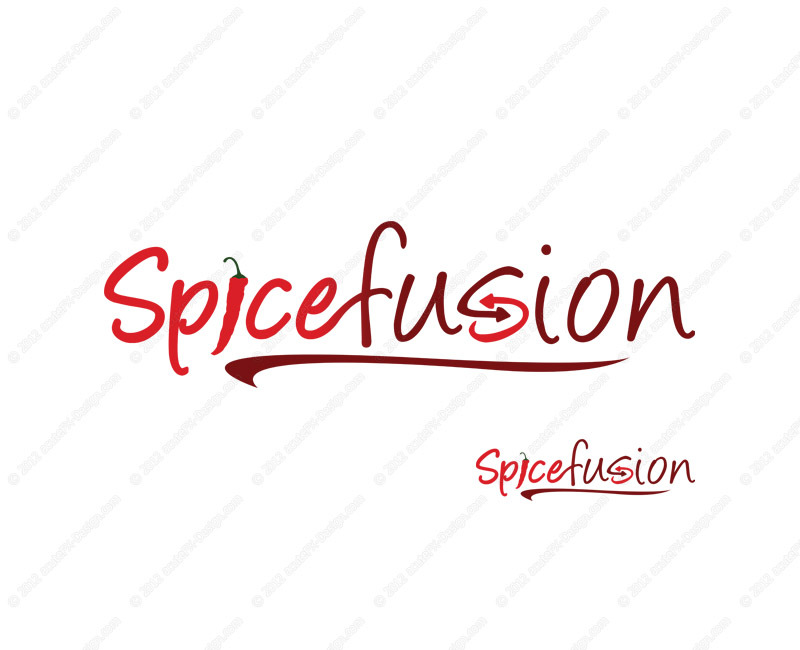 The site allows Spice Fusion to update the pages' layout and look with full control over the site's banners, offers and gallery. A mobile version of the website was also created for users on the go. 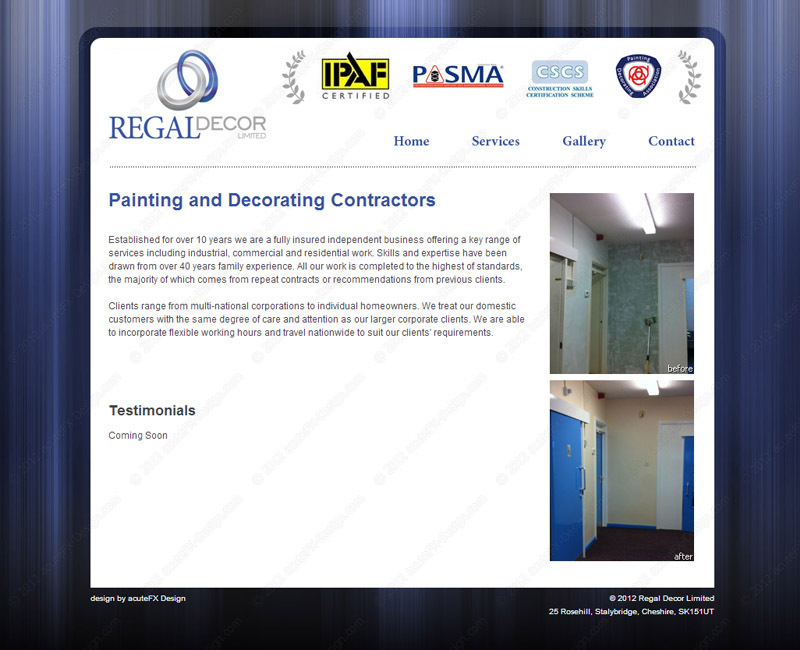 The Regal Decor website is a great example of a simple web-presence, showing information and imagery about their business. 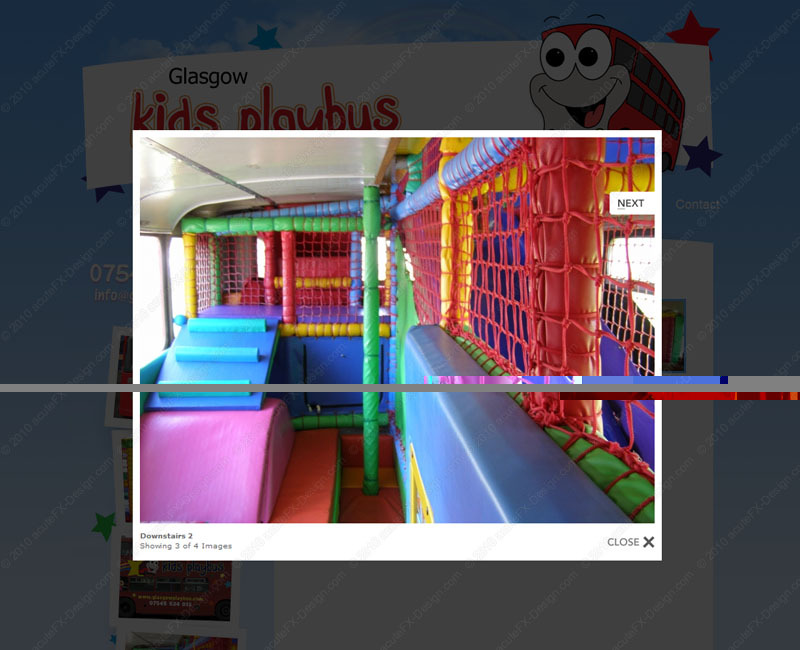 The website is easy to maintain, quick to load and offers the client the ability to control the gallery from a simple upload form - the thumbnails and resizing is all automatic. 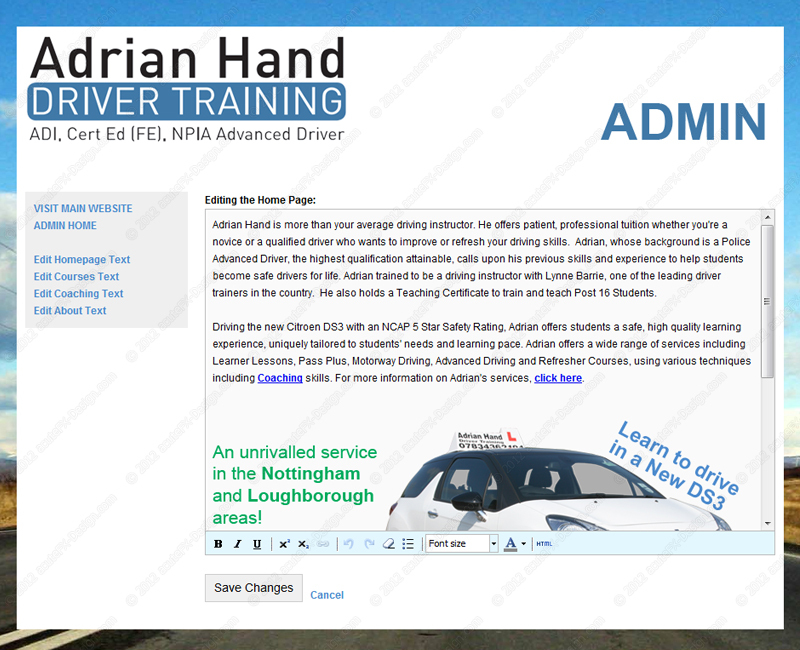 Adrian Hand is a new driving instructor in the Leicestershire and Nottinghamshire area. 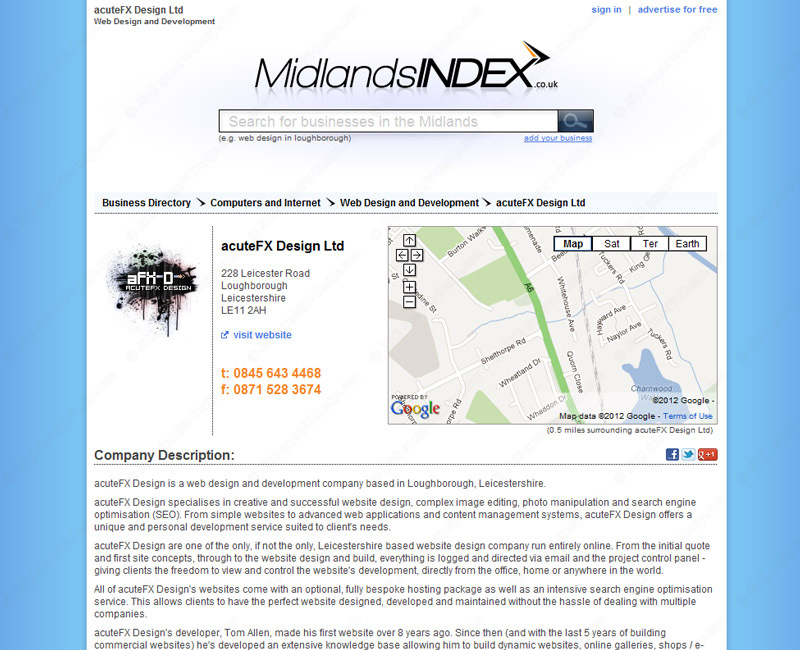 He came to acuteFX Design looking for a unique website to stand out amongst other driving schools. 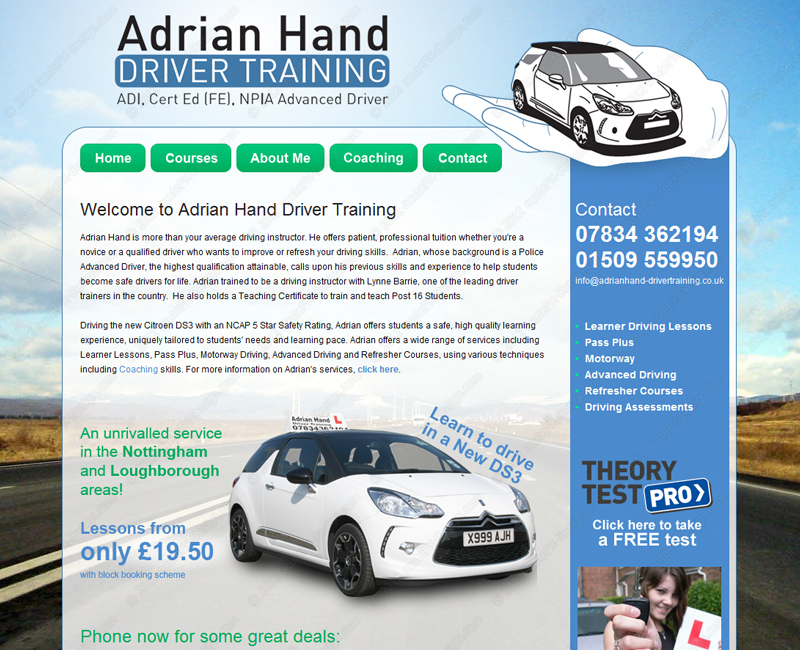 Offering more than the average driving tutor; Adrian now has a website to suit. 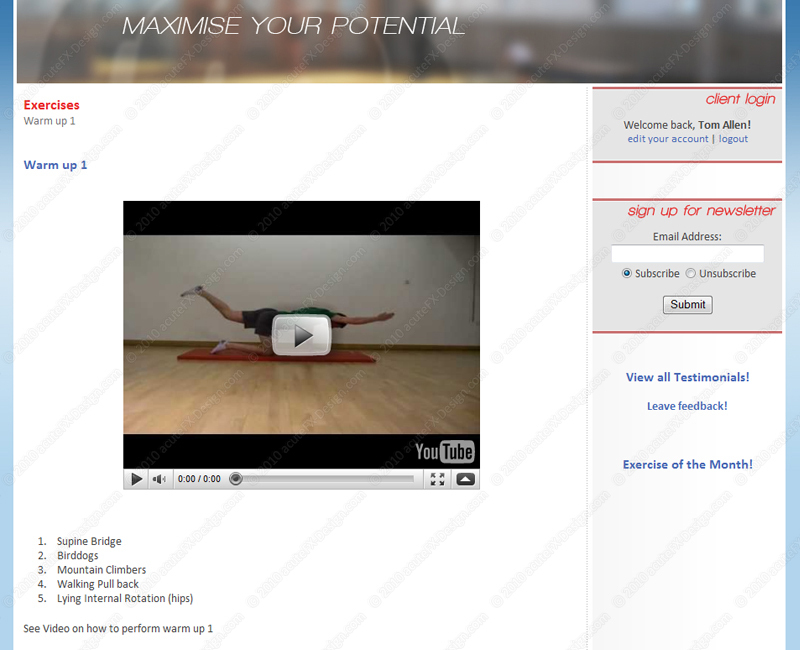 "Tom at acuteFX designed and built my website. He was always available to talk and discuss any issues or alterations and has put together an excellent website at a good price. Its exactly as I wanted it to look but with added hints and tips from an expert. 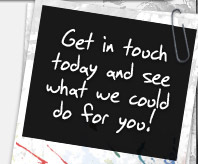 Thanks very much I will certainly recommend you and continue to use your services." 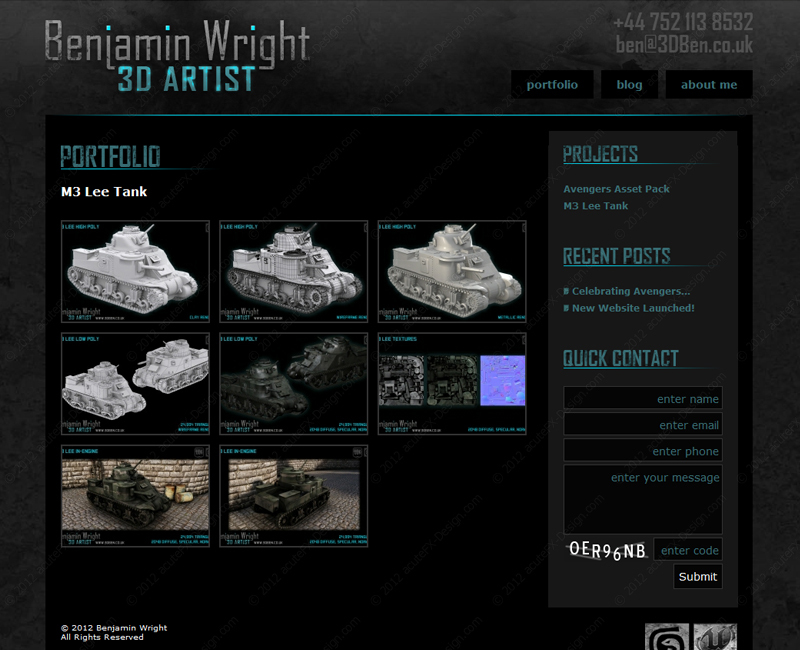 Ben Wright wanted a dark, grungy website to showcase his 3D Models and Artwork. 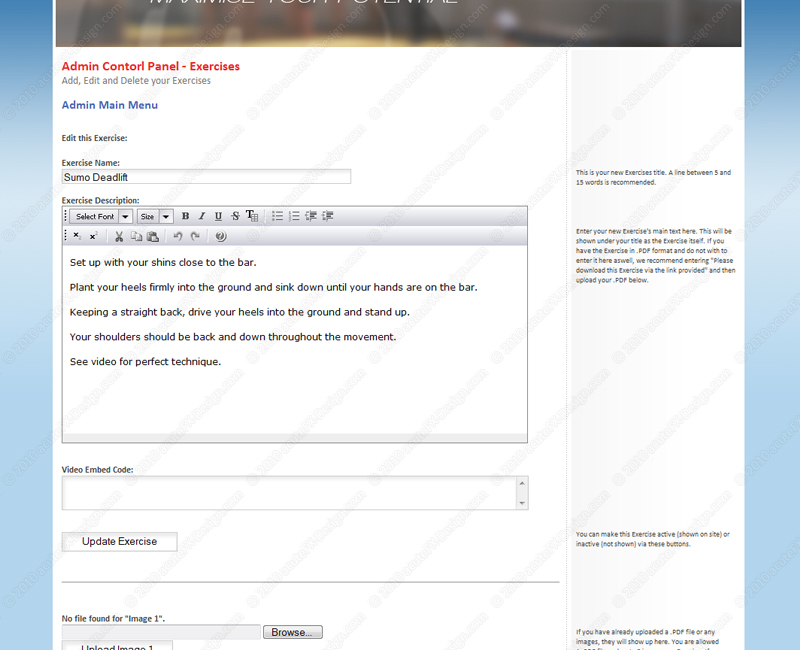 acuteFX Design produced a simple but effect website with a project management system and blog. 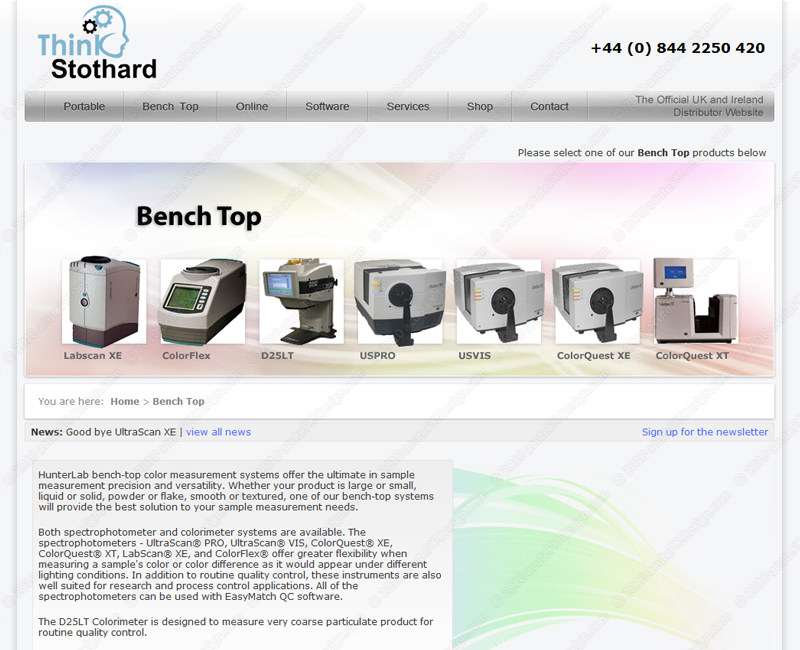 "The website designed was exactly how I had imagined it. The project was completed quickly and professionally and the pricing was impressive in comparison with competitors. If I ever need another website, I know where I'll be going!" Photo Restoration Leicester is a sister-website of acuteFX Design. 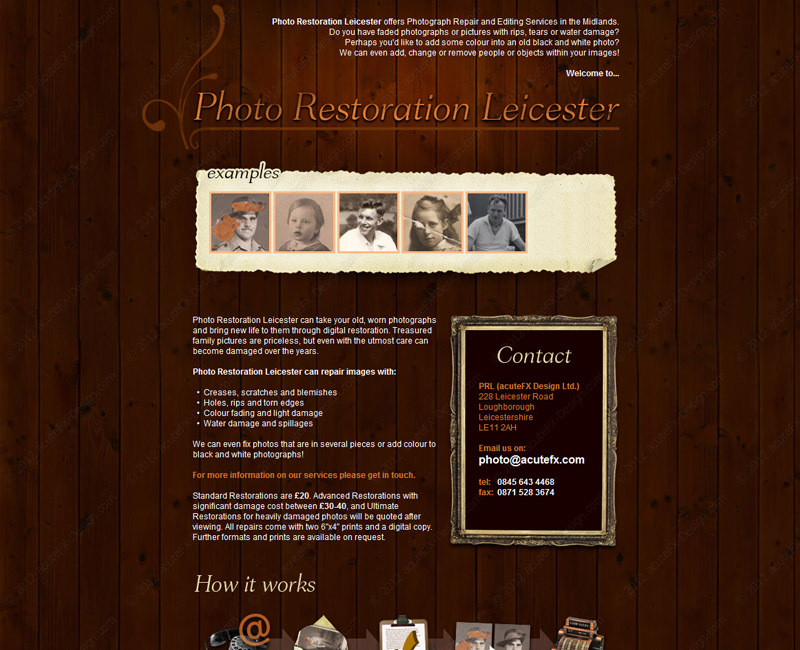 The website has a simplistic 'aged' feel to it and makes it simpler for people to find out about our Photo Restoration services. 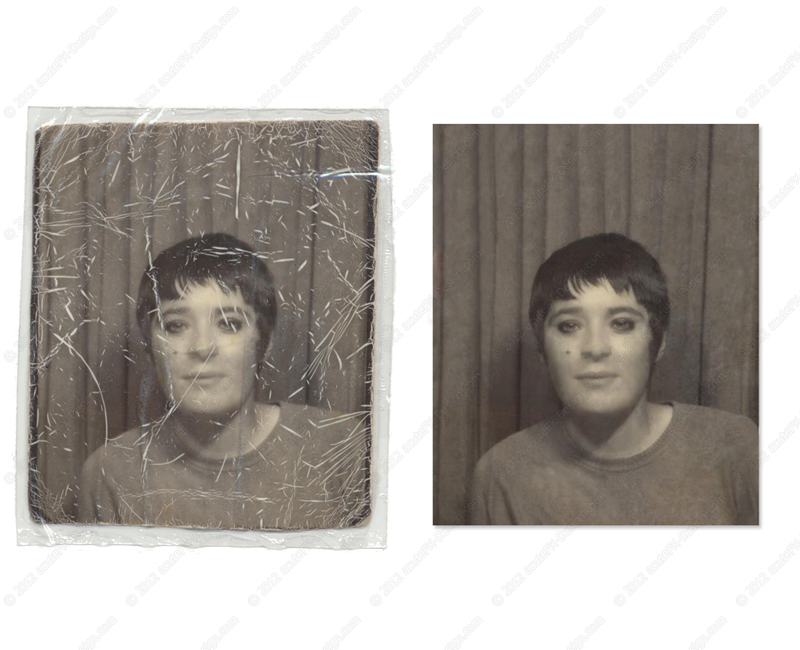 The website also holds some examples of Photo Restoration. 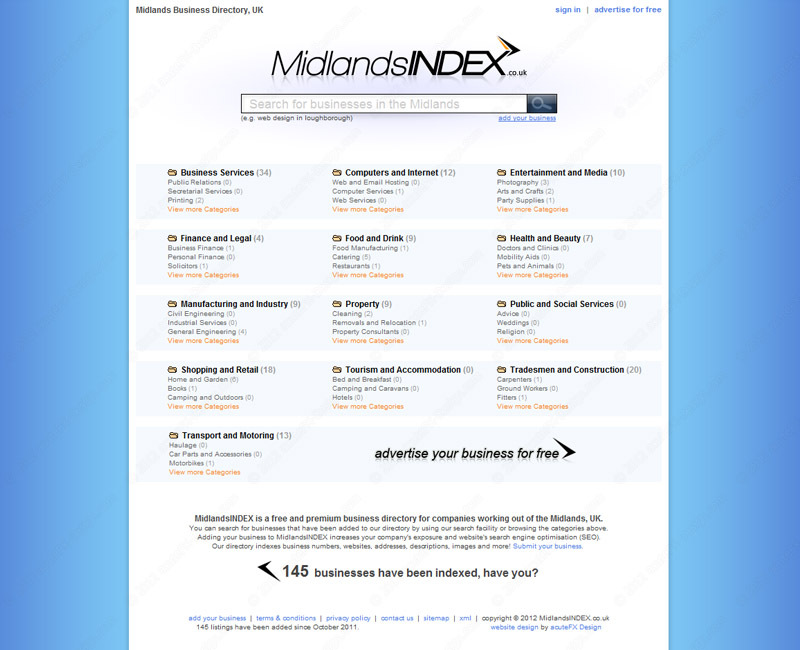 MidlandsINDEX is a young but growing business directory built and managed by acuteFX Design, offering free and premium advertising for business in the Midlands and surrounding areas. 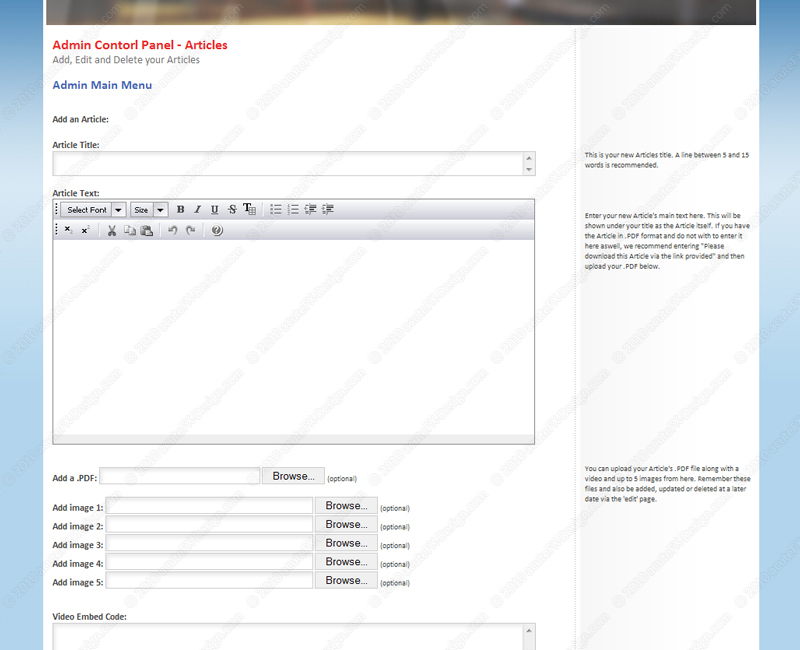 The directory was build from scratch and includes an advanced search feature, account management and listing statistics. 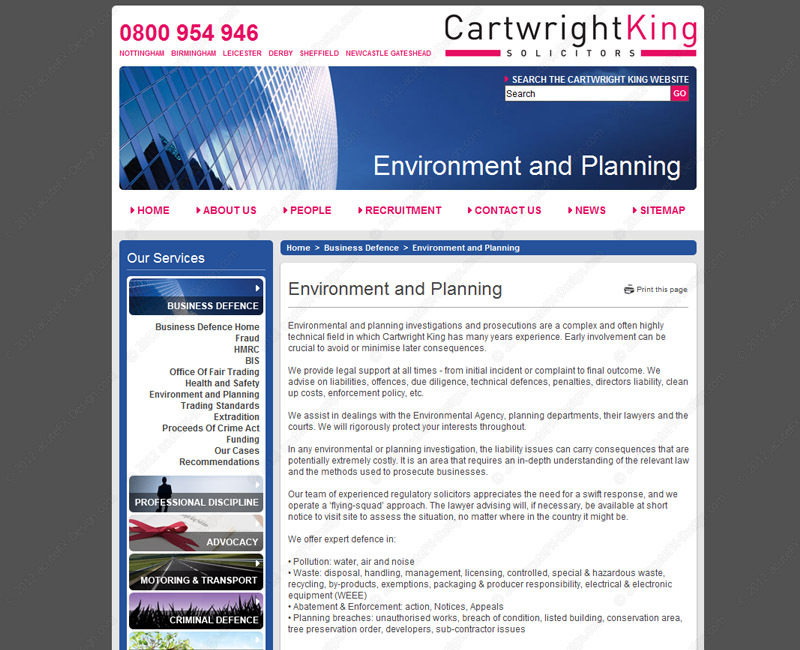 Cartwright King hired acuteFX Design to rebuild their website with a new design and strong emphasis on search engine optimisation. 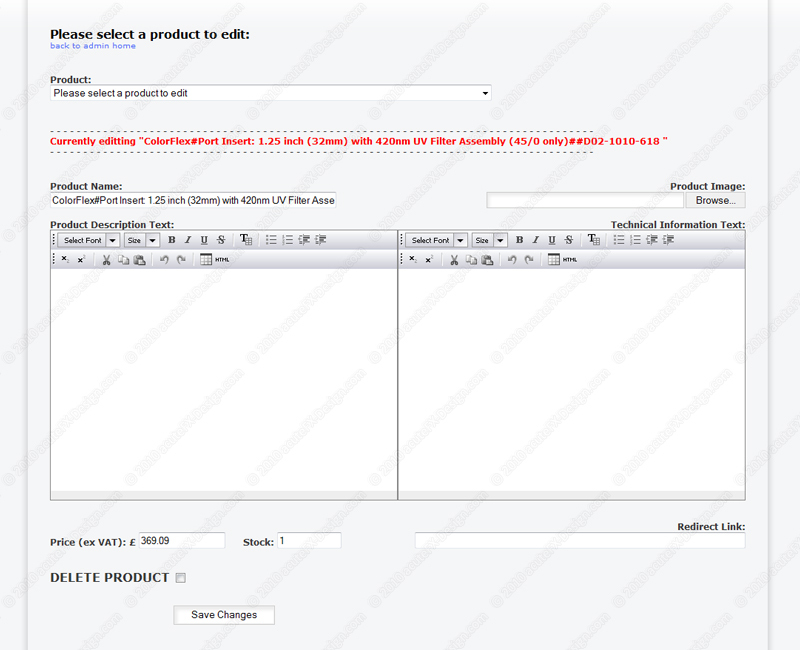 acuteFX Design created a fast loading, very flexible and dynamic website which includes a high level of SEO. 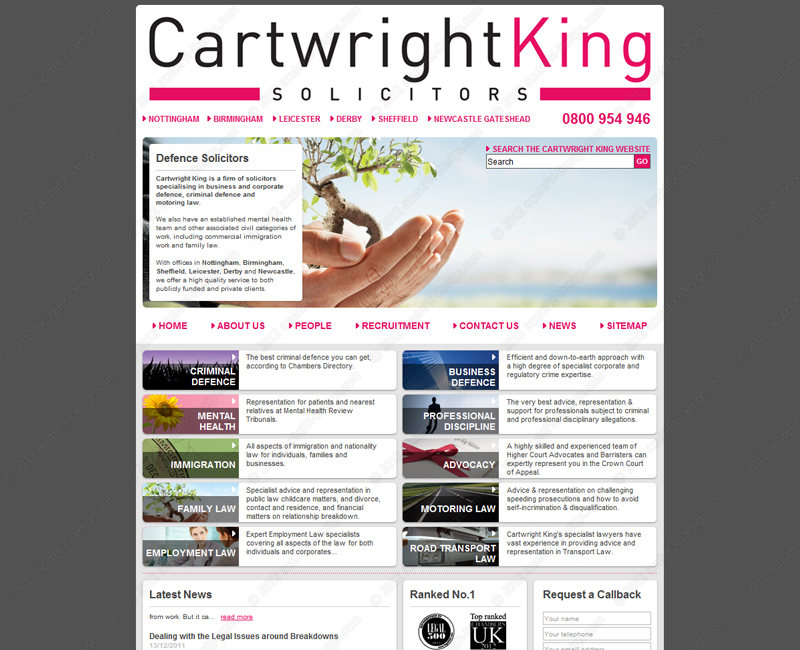 Cartwright King are ranked amongst the highest solicitors in the UK by both The Legal500 and Chambers & Partners, and now have a high-ranking site to suit! "acuteFX Design offer a very professional website service and provides prompt, value for money services. 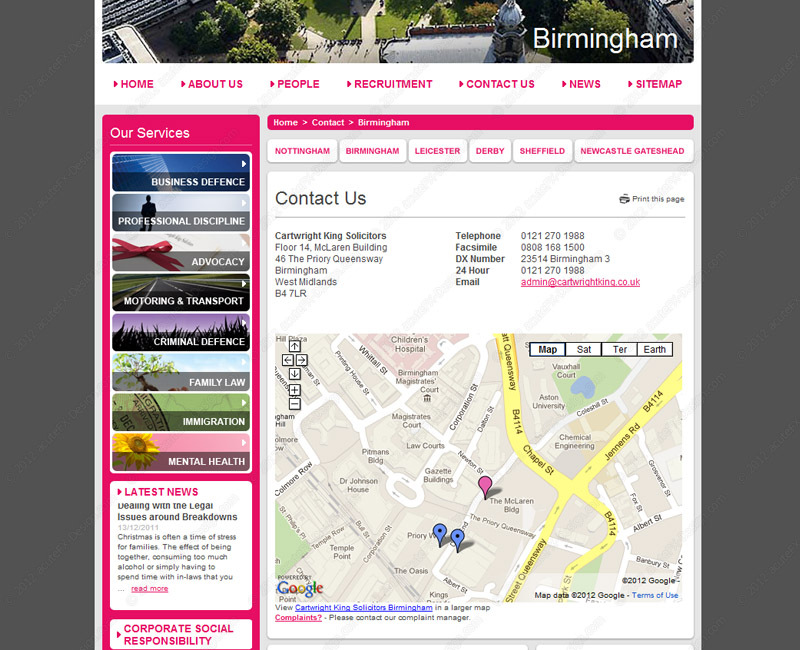 As a leading law firm in the Midlands we are very pleased with their work on developing our new website and would recommend their services. " 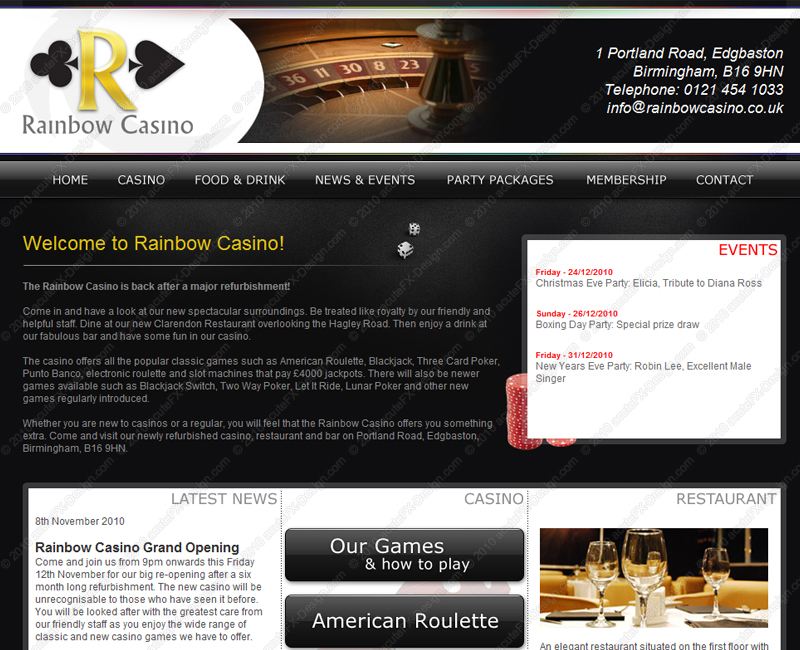 Rainbow Casino (Birmingham's oldest casino) recently went through a 6 month refurbishment and needed a brand new website to go with their sleek new look. acuteFX Design designed and developed a professional and graphical website, incorporating a full content, news and event management system within the build. "Tom Allen, acuteFX Design, was recommended to me by one of our suppliers as someone who could produce what we were looking for in a website. I worked with Tom over a period of seven months to produce a brand new and bespoke website that served the needs of our business better. Throughout this period of time Tom was very professional and would always go the extra mile by meeting any requirements we had. 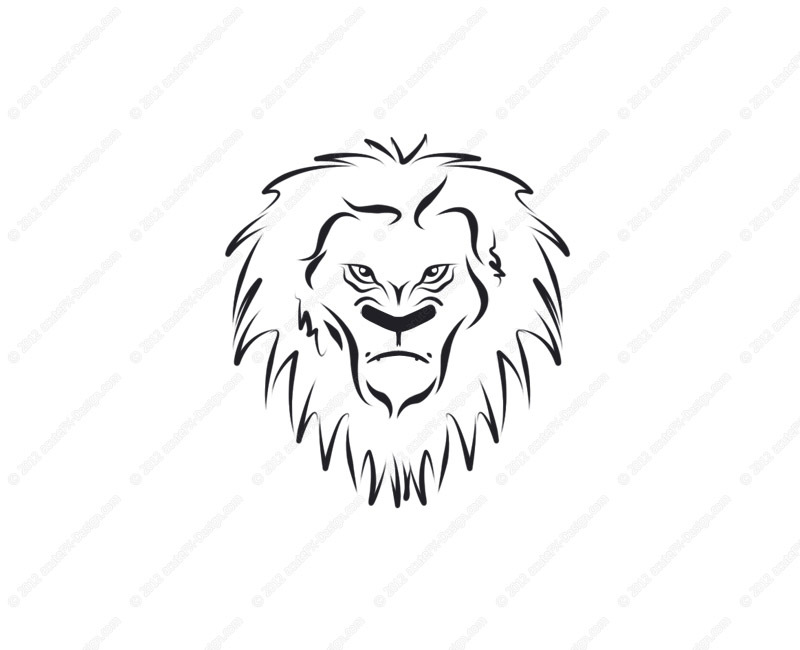 He also worked very quickly to help with other problems we encountered with our old hosting services and email, which at the time were not his responsibility. 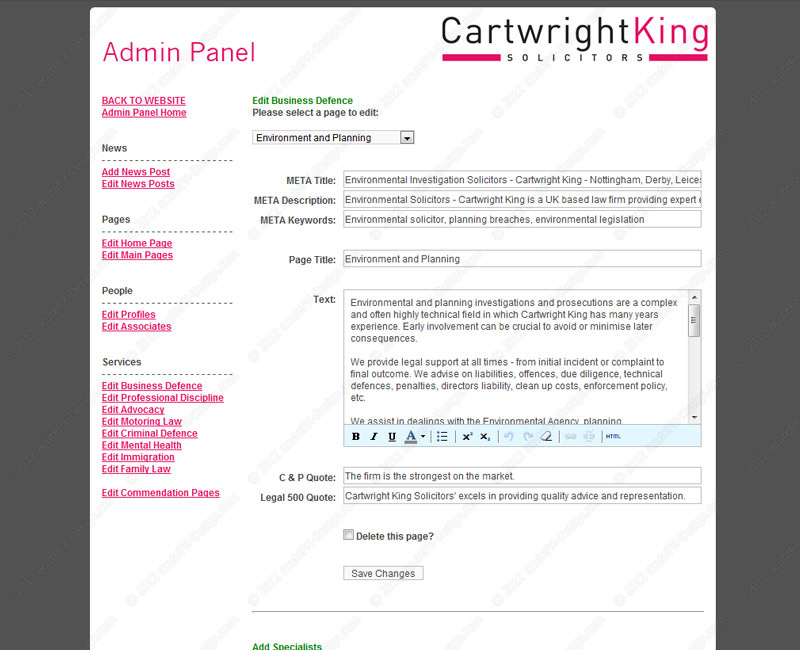 I would not hesitate to recommend Tom to any other business looking for a great website." 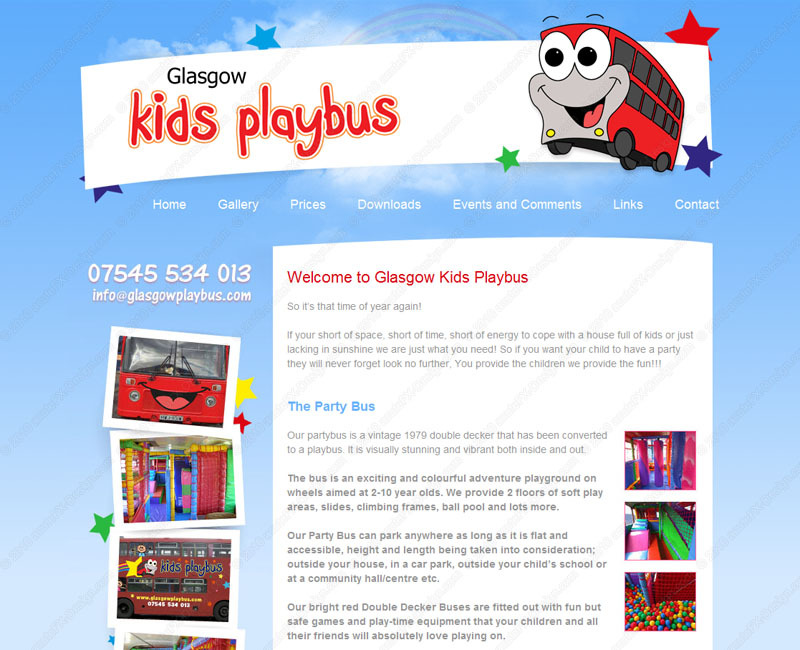 Glasgow Kids Playbus asked acuteFX Design to build a fun and colourful website to help build interest for their new business. 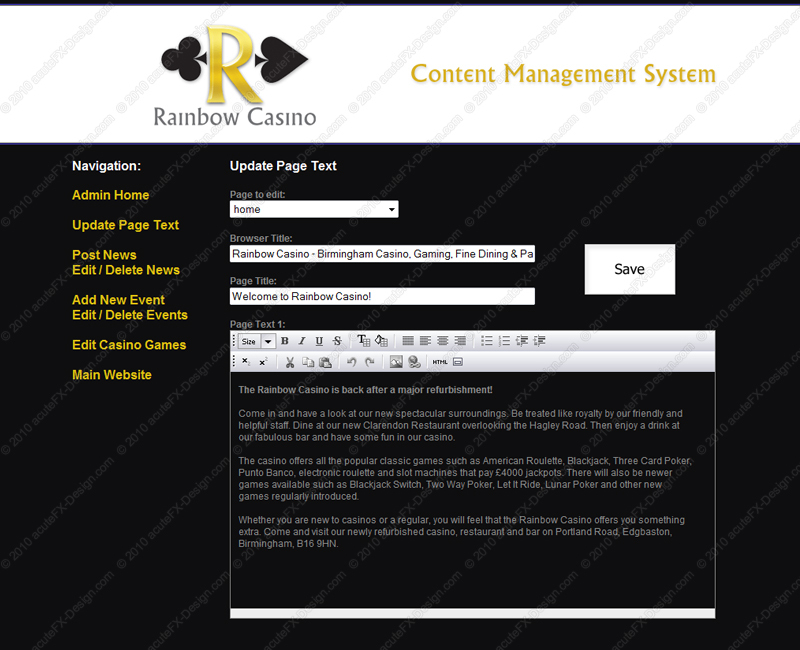 The website is controlled by a content management system so keeping the site up to date can be done simply and quickly. 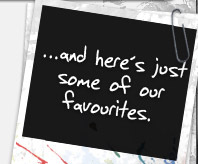 acuteFX Design also designed party invitations and thank you cards that match the site's colour scheme. 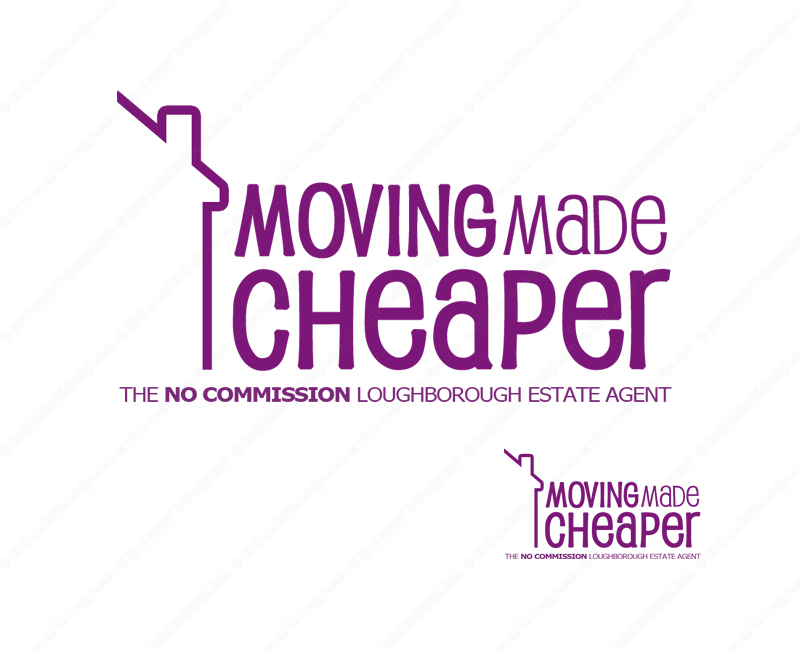 Moving Made Cheaper is an estate agent in Loughborough that differs from other estate agents as they only charge a one-off fixed fee of £699. 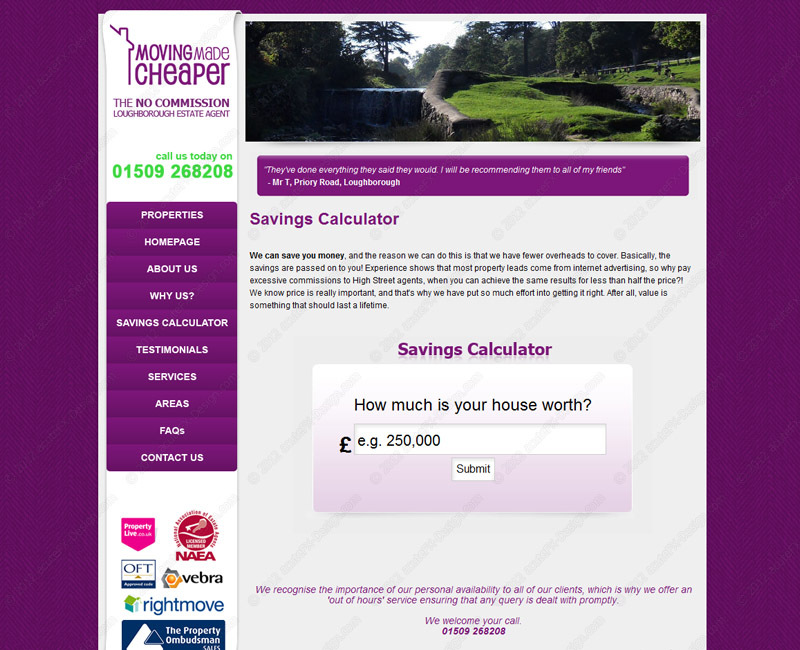 They wanted their website to be modern and different from other agents' websites and it was also to include features such as animation and an interactive map. "We thought that designing and building our website would be a huge task, but Tom at acuteFX made it so simple and helped us every step of the way. He answered all our calls and emails very promptly and answered all of our questions honestly and knowledgeably. 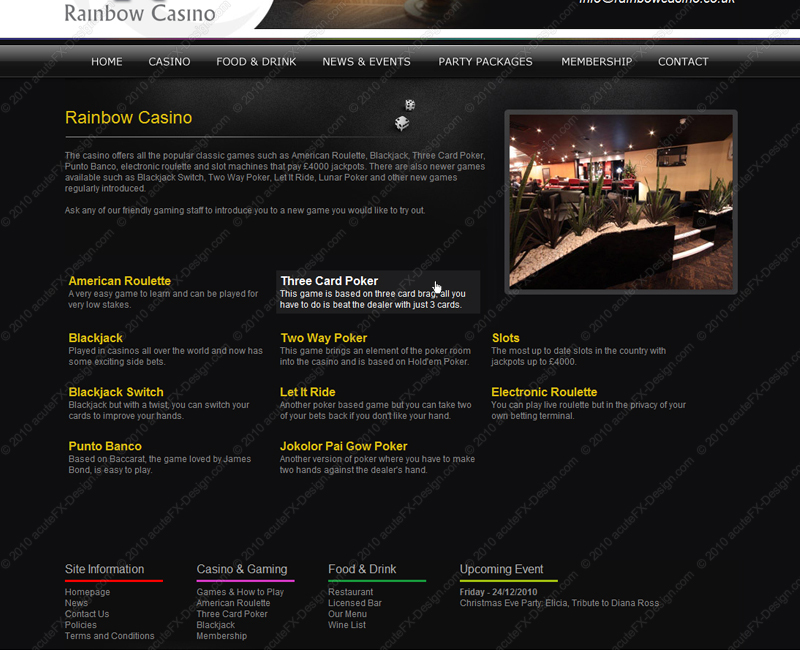 We were actually able to go live before the date planned and the finished website is amazing. 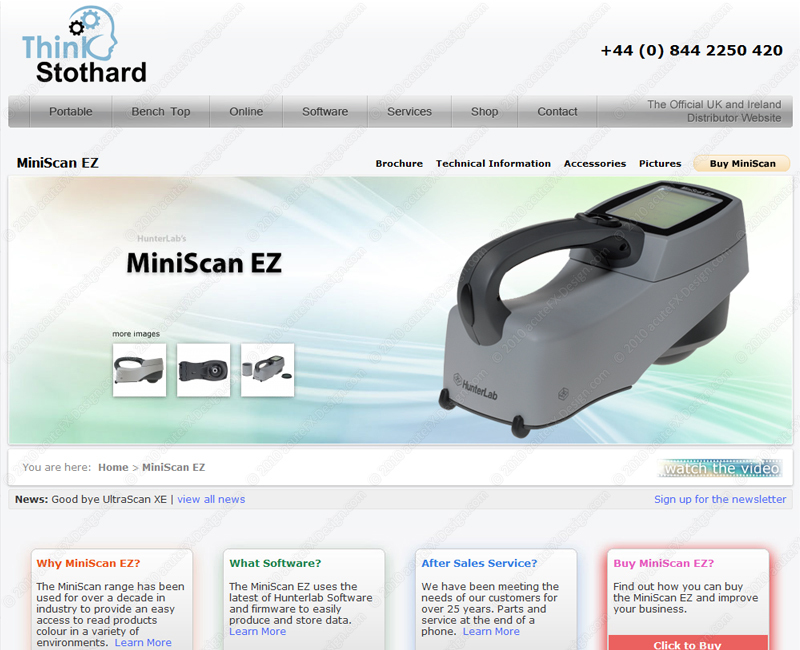 We have already received fantastic comments about it!" 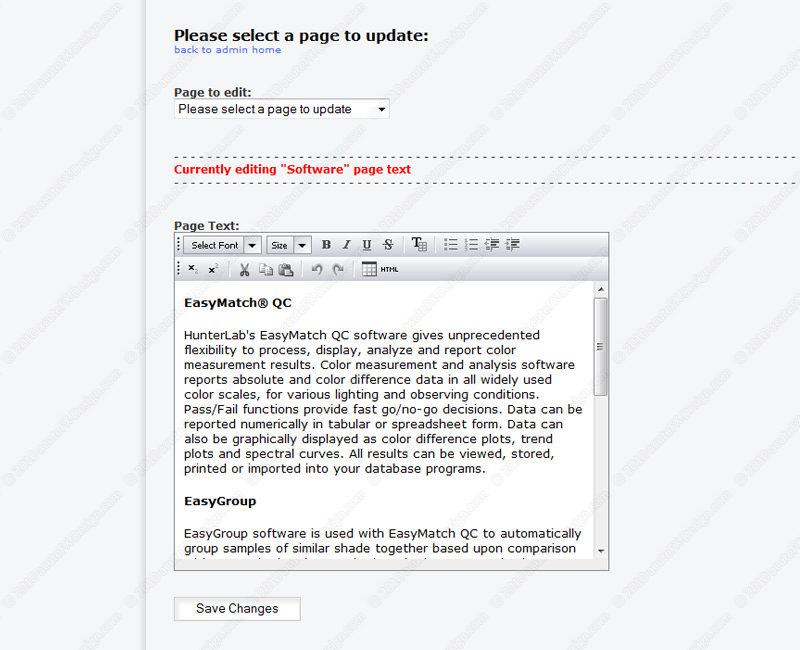 The Think Stothard / Hunterlab website was a joint development between acuteFX Design and Network 1000. 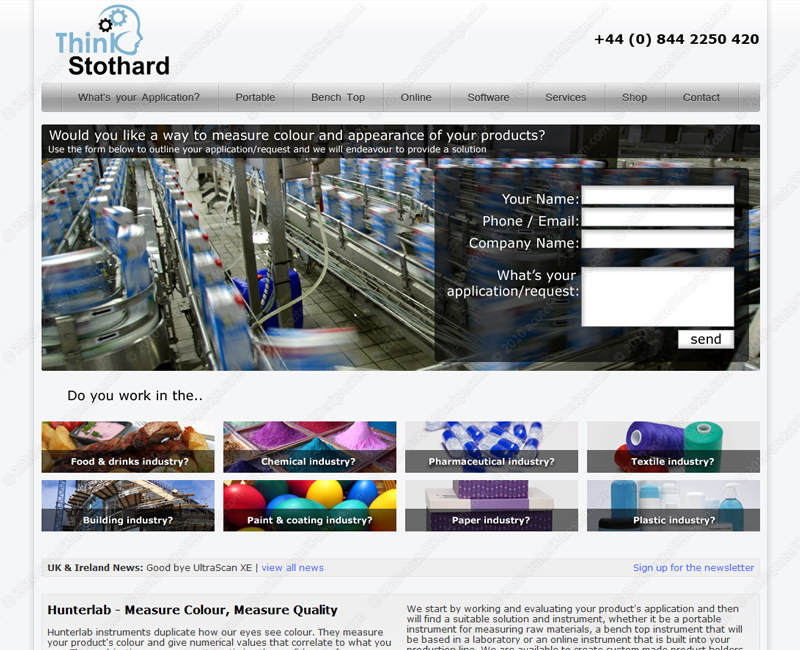 This informational website shows off Think Stothard's devices for colour measurement as well as their services and ways to purchase or get in contact. 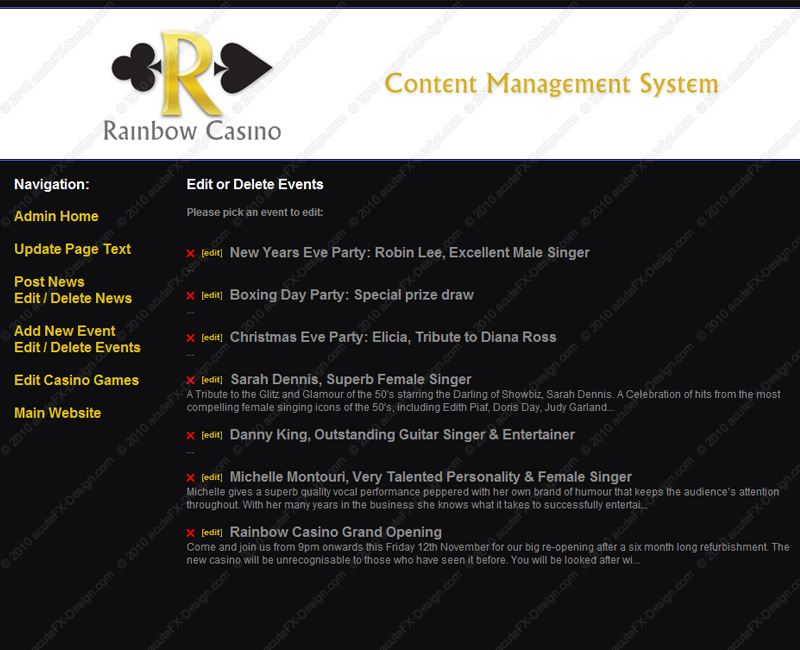 The website uses a content management system to control all website text and imagery along with items in the shop section. 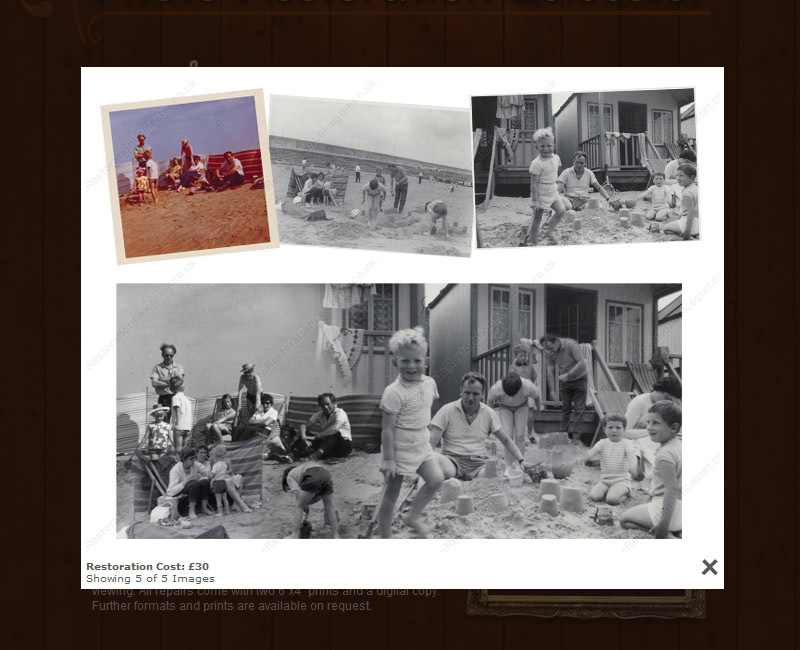 Other features on the website include animation on the front page to cycle through several images and a 'quick-contact' form. 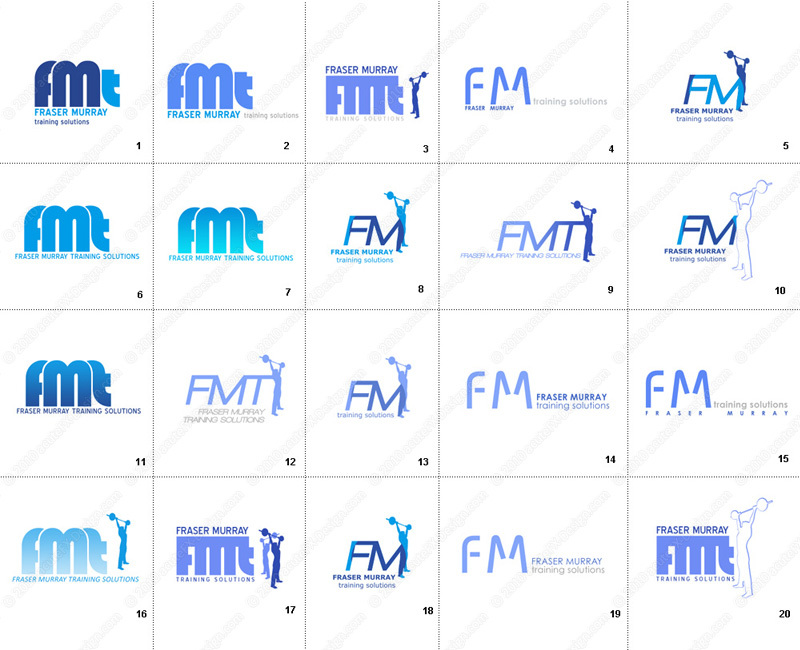 The FMTraining.co.uk project was outsourced to acuteFX Design by geeksource. 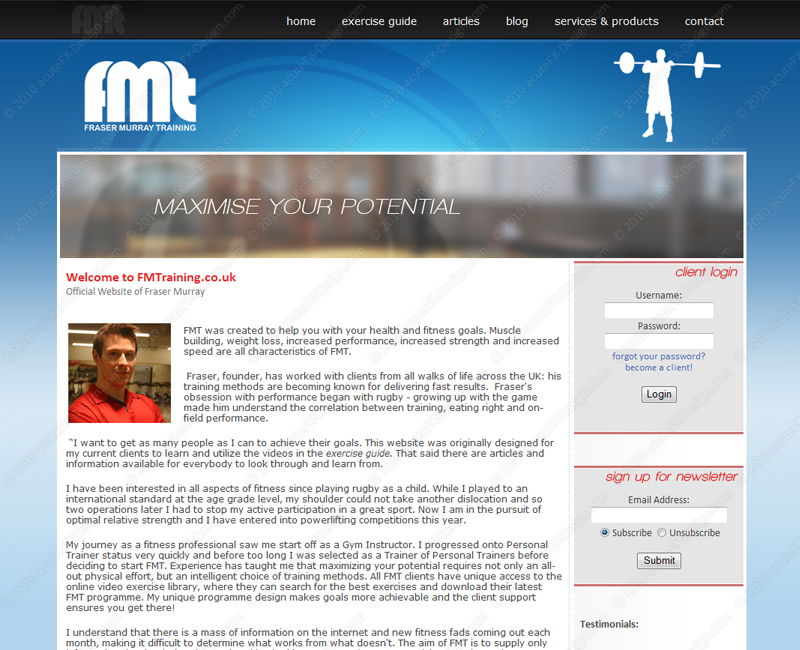 Fraser Murray (fmtraining.co.uk's owner) wanted a website that he could instruct his clients with via exercise programmes and member-exclusive videos. 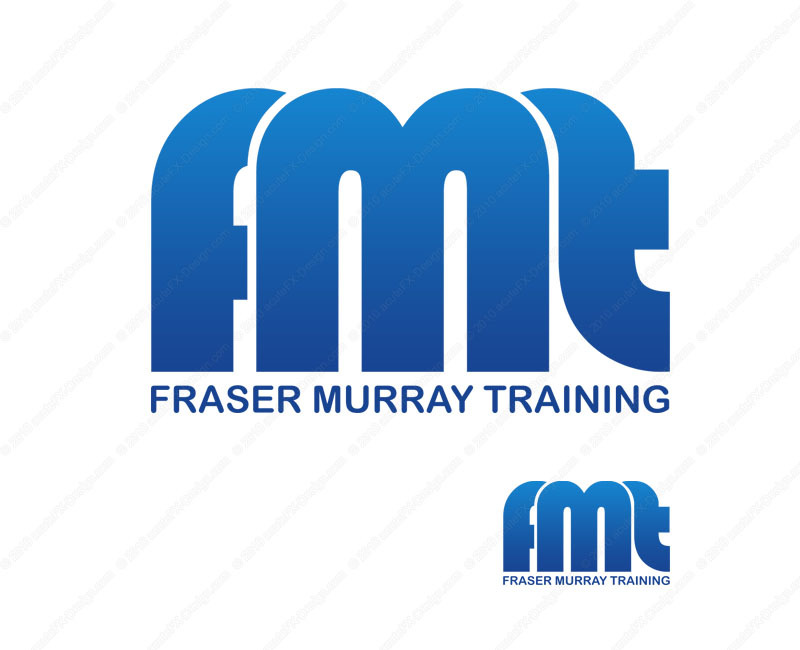 acuteFX Design created the website to be controlled with a content management system so Fraser could easily add articles, text, images and videos without any programming know-how. This graphic was originally designed to be part of a logo, but after the logo design brief changed it went unused in the final product. 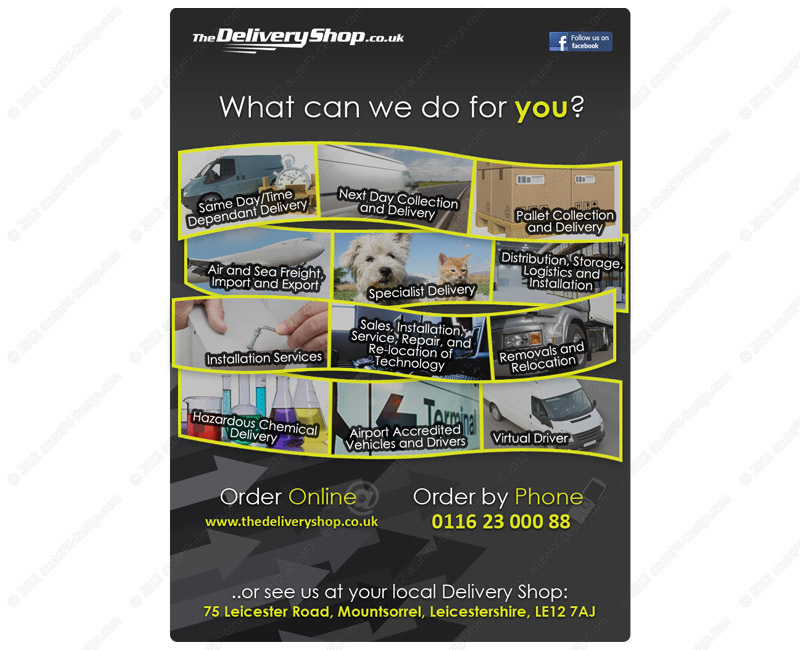 The Delivery Shop is a Leicestershire courier who came to acuteFX Design for a website as well as several other designs. 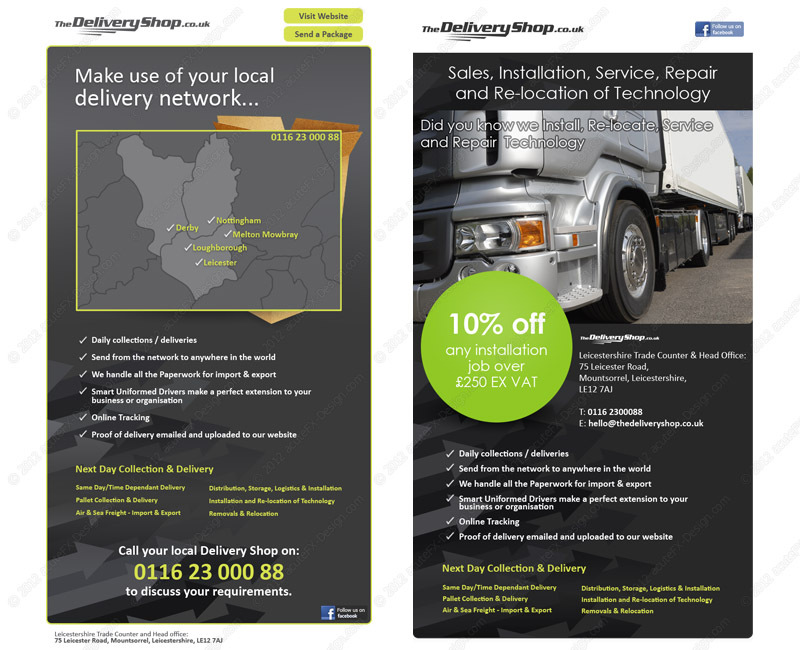 Shown here are three newsletters we designed for their email marketing campaign. 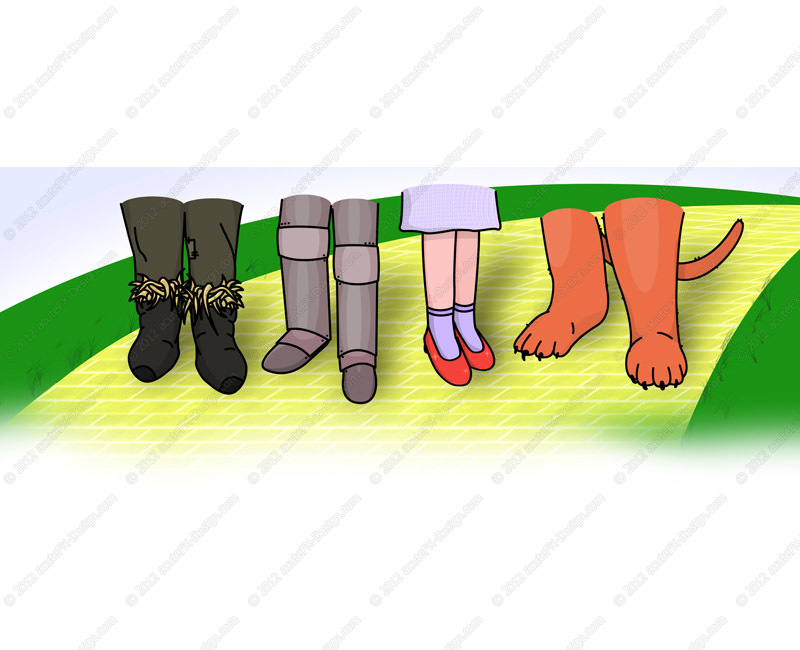 Moving Made Cheaper came to acuteFX Design looking for a graphic based on The Wizard of Oz to help describe their knowledge, compassion, vision and courage. 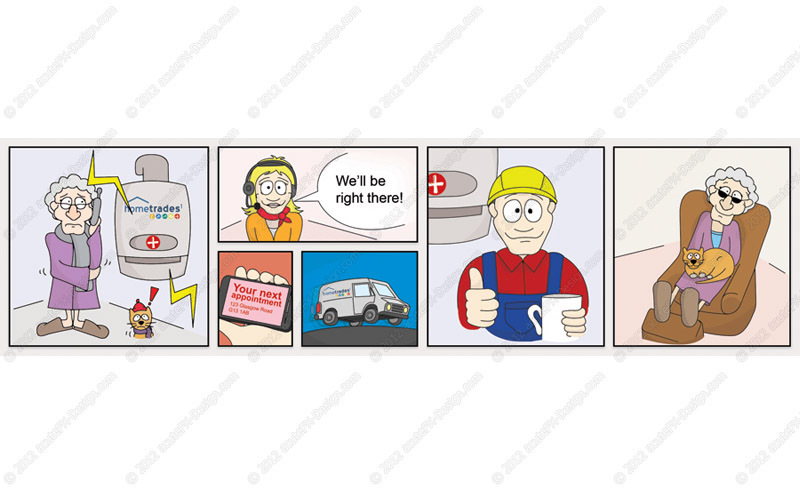 Hometrades1 wanted a comic strip depicting their care plan, which could be used on online and offline material. 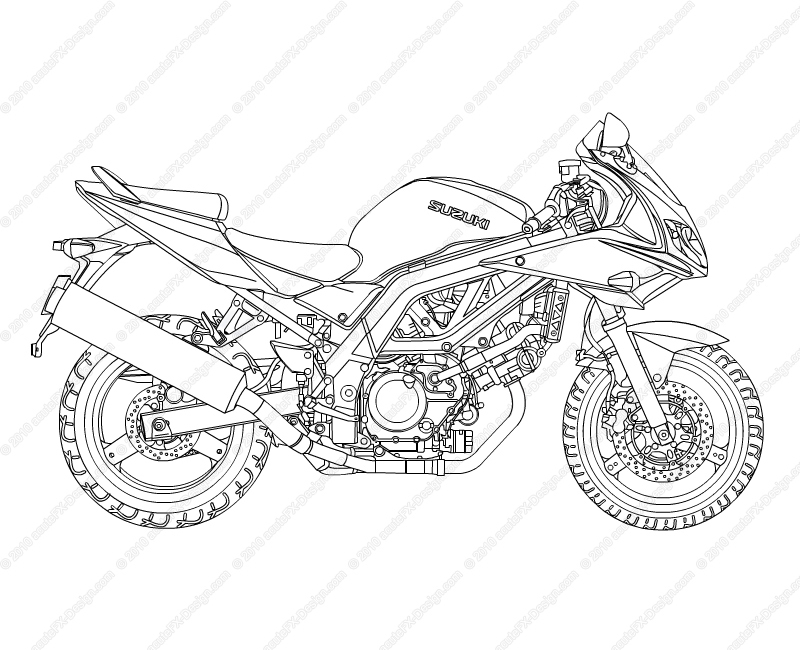 The graphic was drawn by hand before creating a full 300DPI digital version. 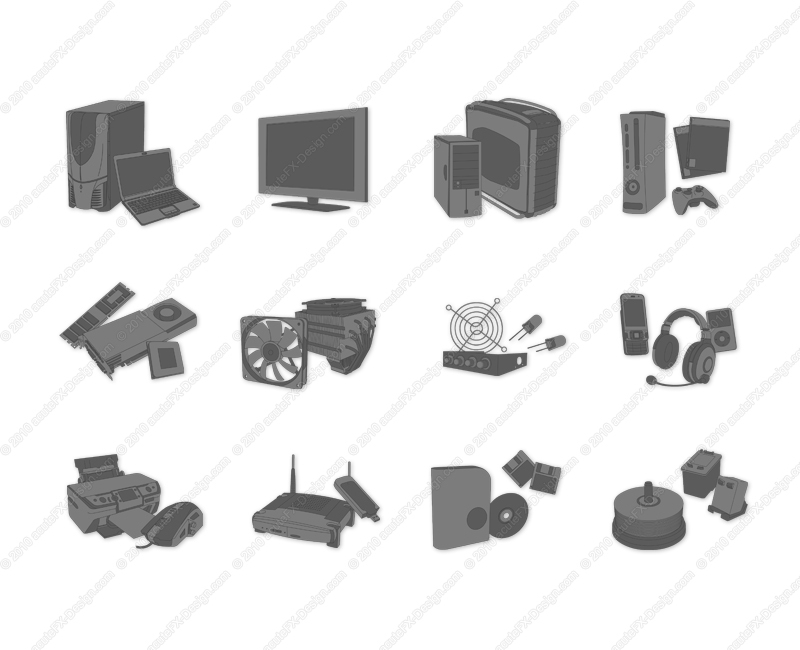 These icons are part of the website design for STORMComponents - a trading company owned by acuteFX Design Ltd that will soon be selling high-grade computer components and cooling accessories on STORMComponents.co.uk. 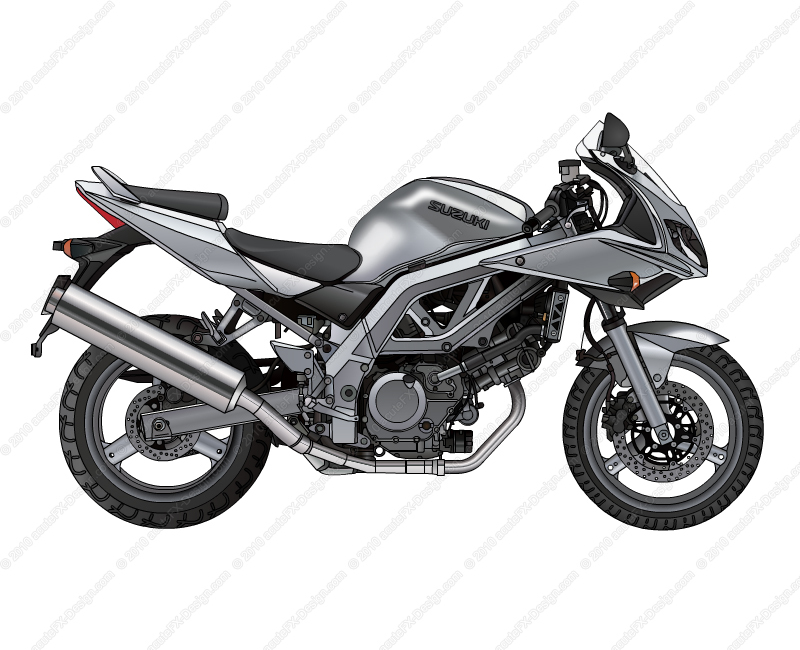 This motorbike was traced and coloured for a website but was never actually used. Several hundred lines were drawn to create this image, and because it was traced in Flash could be fully animated if needed. 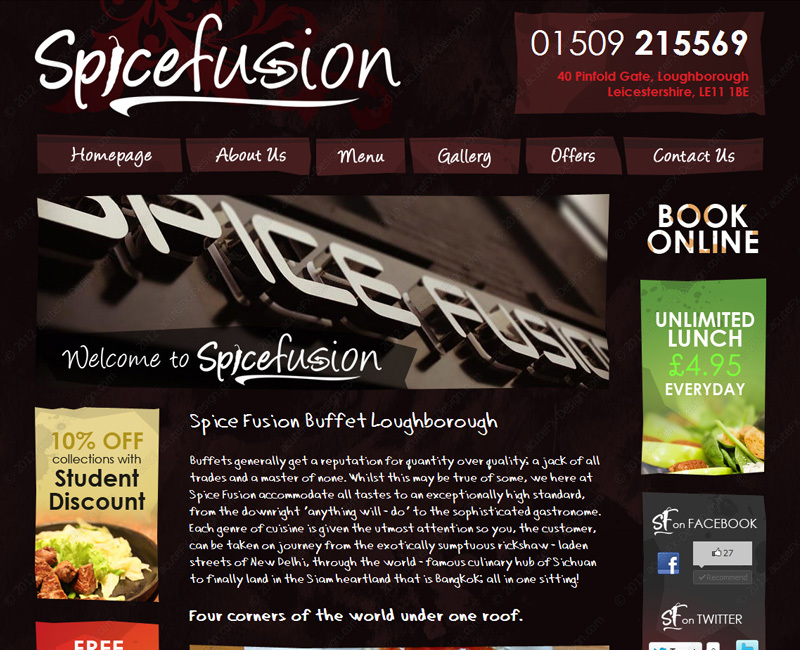 Spice Fusion is a Buffet Restaurant about to open in Loughborough (April '13). 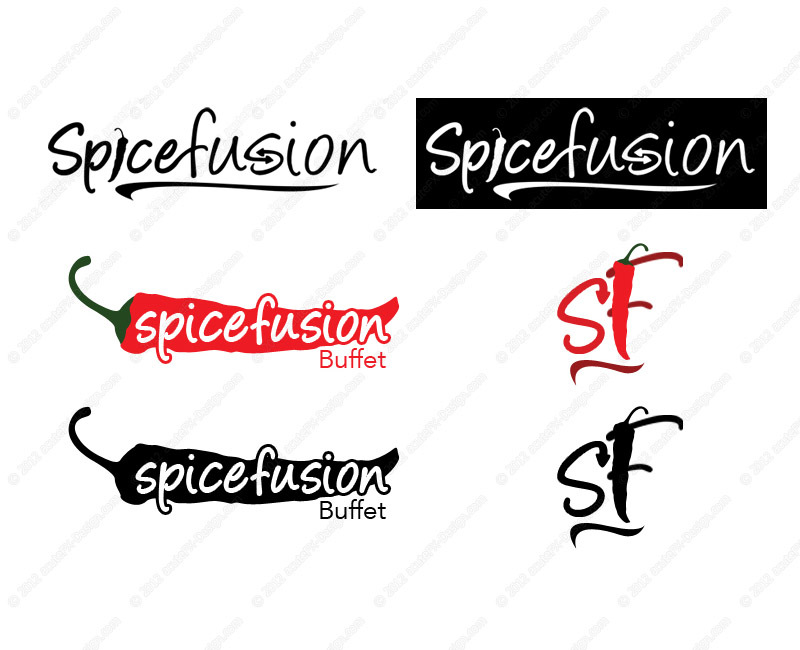 acuteFX Design were instructed to design a logo which portrayed both spice, and the fusion of flavours. 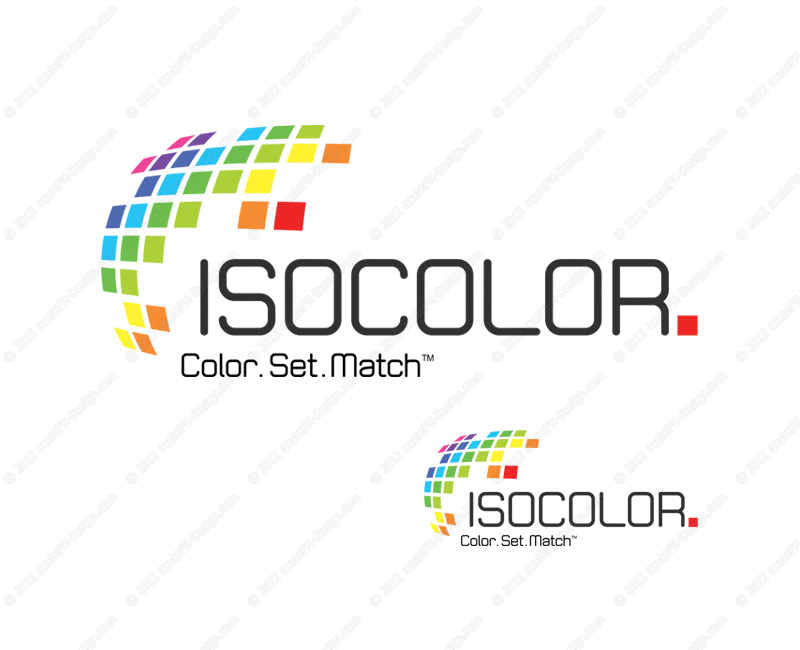 ISOCOLOR (linked with the below 'ISOLAB') wanted a colourful and recognisable new logo to go with their website and branding overhaul. 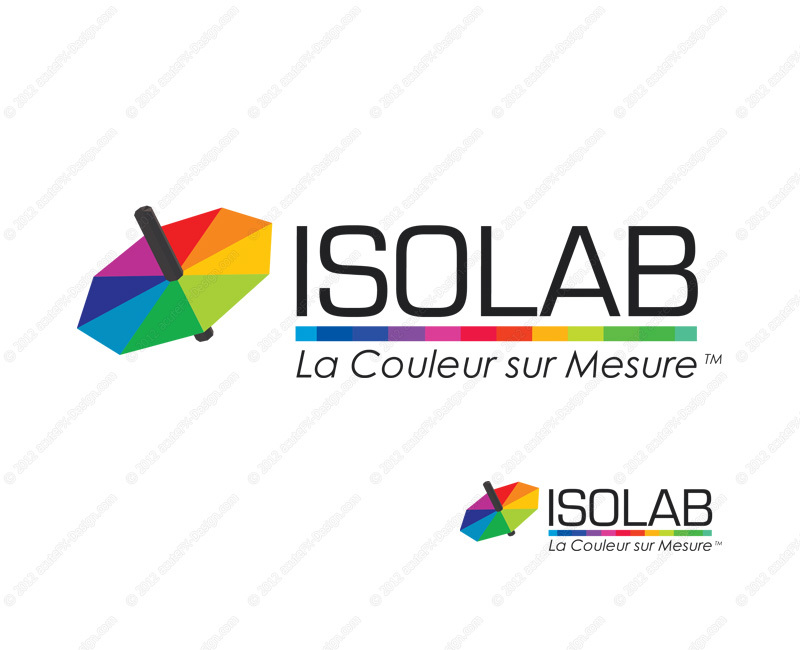 ISOLAB are currently updating their branding and website and have come to acuteFX Design to bring their designs up to speed. 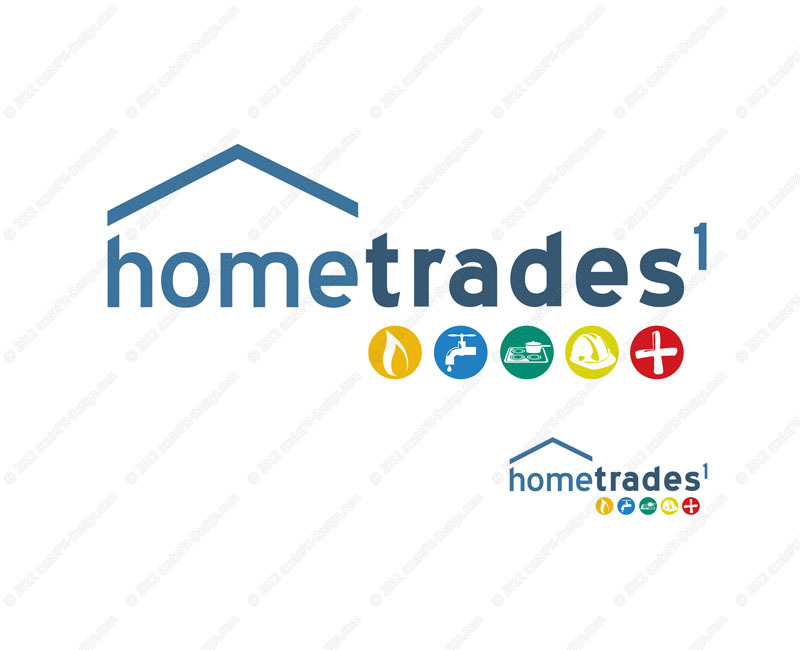 acuteFX Design was to produce a logo for HomeTrades1 which would be instantly recognisable and also conveys their services. 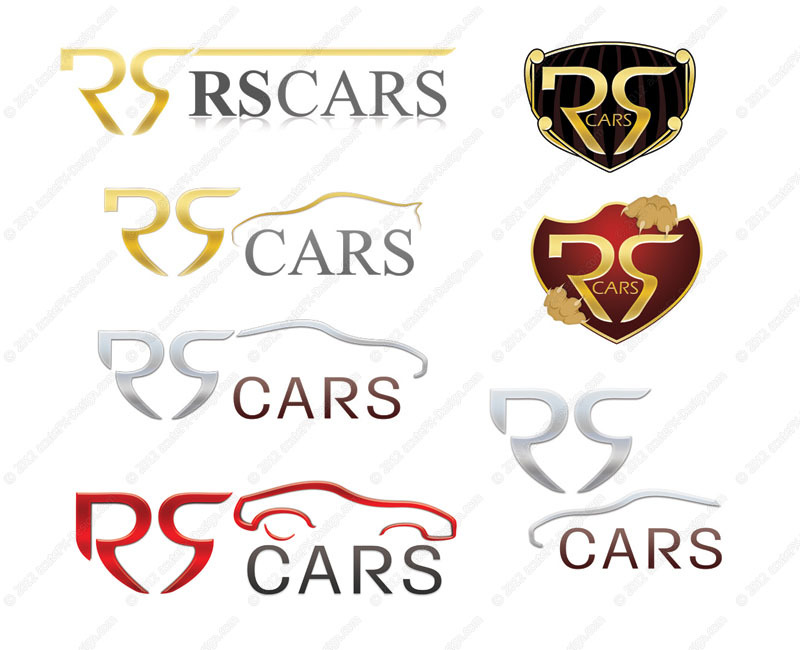 RS Cars wanted a quality logo design that reflects their brand. Our brief was to include a car in the design if possible. 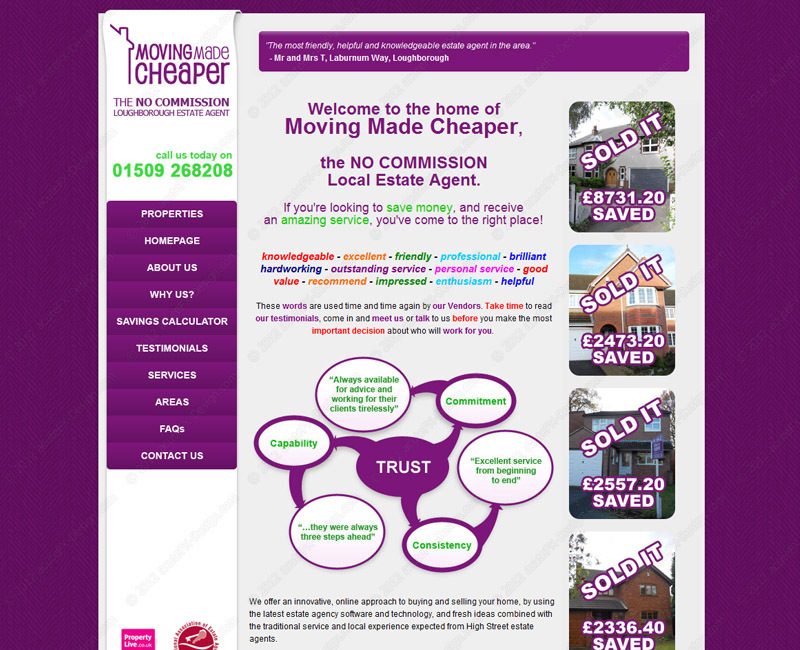 Moving Made Cheaper wanted a logo that would work on their sale boards, flyers and business cards. acuteFX Design also created a reverse copy in white that works nicely on darker backgrounds. 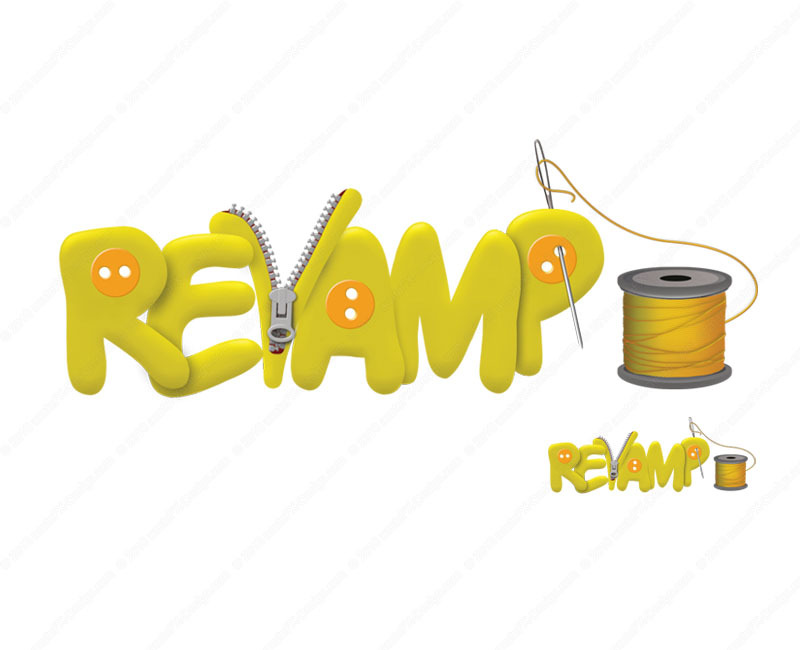 Revamp is a shop starting up in Loughborough offering clothing, clothing repairs and jewellery. We wanted a logo that reflected the sewing side of the business and after a few concepts we had the perfect piece. acuteFX Design took a photograph of a bus at a slight angle and warped it into a "cartoony" perspective, we then sketched out how we wanted the face on paper before making a digital copy. 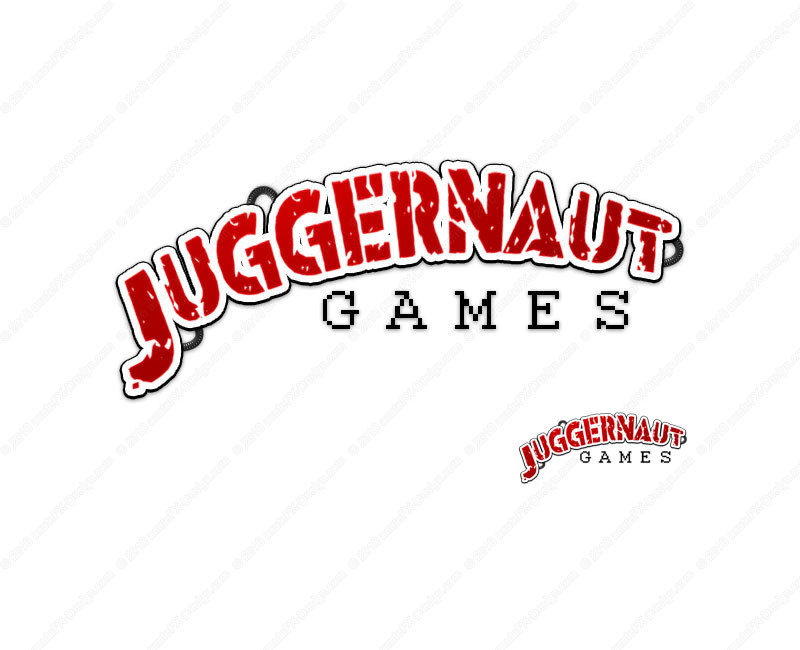 After several pages of concepts, CQC decided on this for their company's logo. 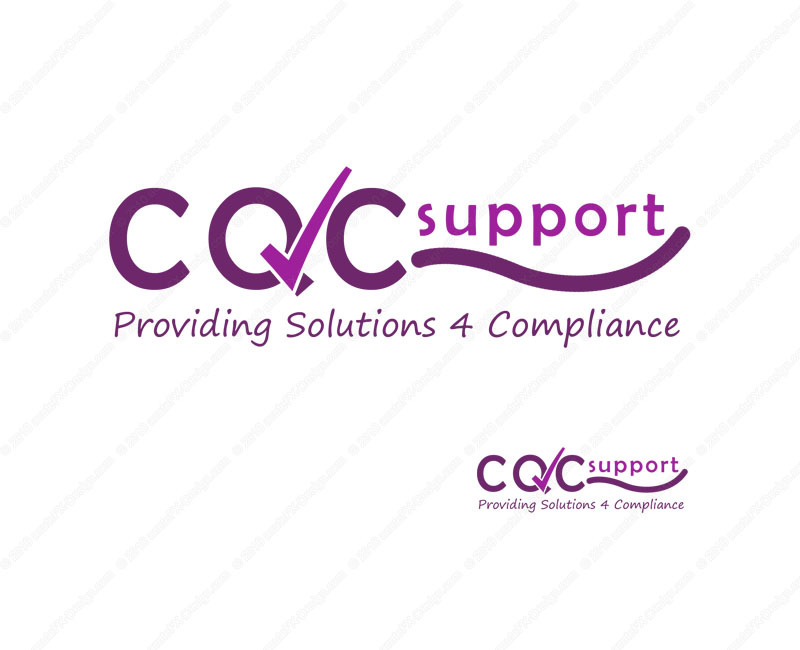 CQC wanted a logo that portrayed a "supporting" theme and also wanted a tick to be included. 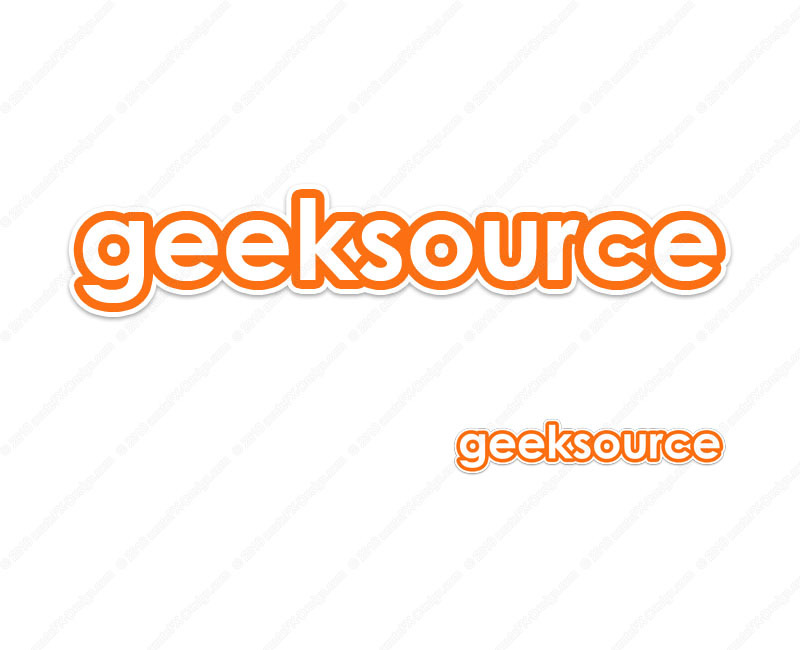 geeksource wanted a simplistic, modern and recognisable logo designed to be used on their website, business cards and stationary. This logo was designed at 300DPI so it was perfect for printing. A simple logo designed for branding on a college project. 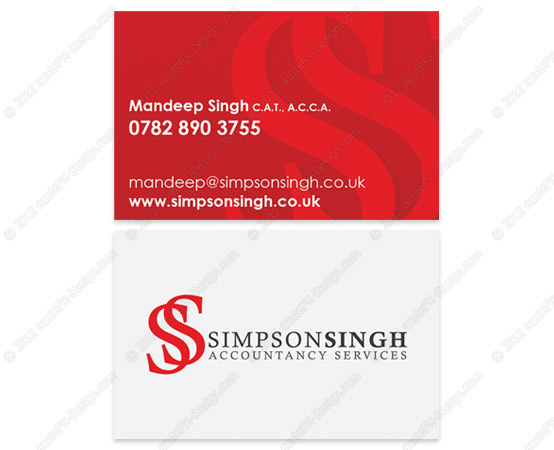 Simpson Singh Accountants came to us looking for a bold and professional business card, using their strong red company colour. Karen at Revamp needed a business card that reflects the two sides of the business. 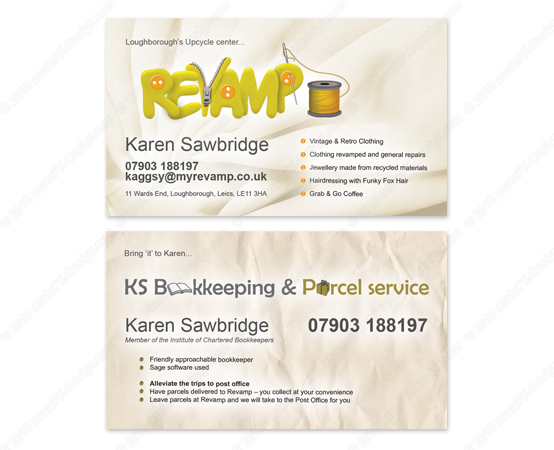 The front is for Revamp - a vintage and retro clothes specialist, and the back is for a bookkeeping and parcel service. 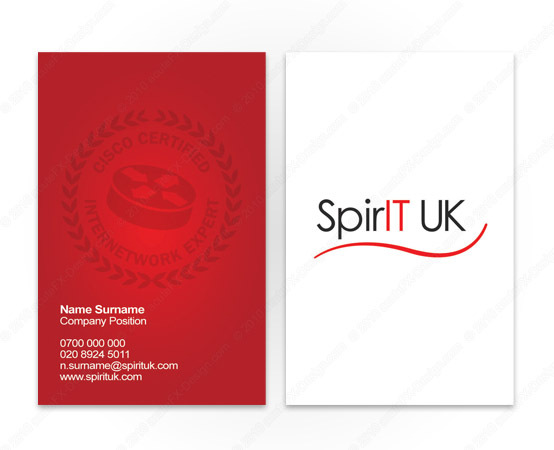 Spirit UK needed business cards designing for 8 of their employees. 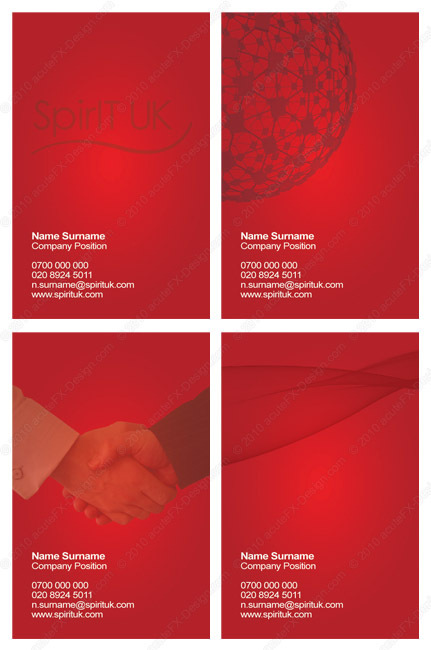 Some of the cards were to have a Cisco watermark and the rest just needed something to 'break up' the red background. 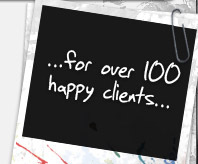 "I have been extremely happy with the service I received from acuteFX Design. 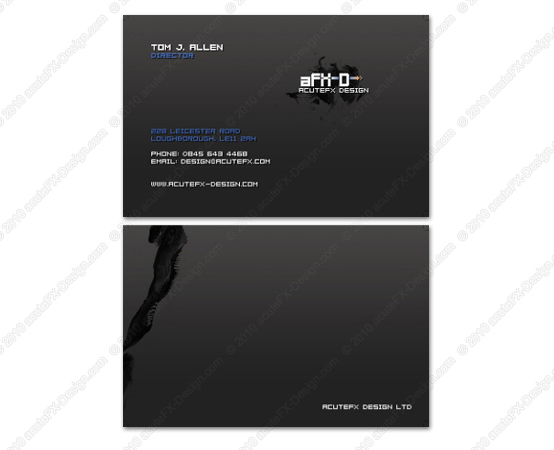 They were recommended to me by a colleague to design some business cards for our team. After having dealt with some time-wasters, I was pleasantly surprised to finally find a company who not only delivered when (or before) they promised to, but were also helpful, friendly and efficient. 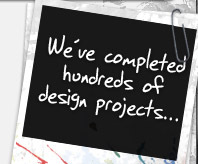 The designs we received were very classy and to an excellent standard. 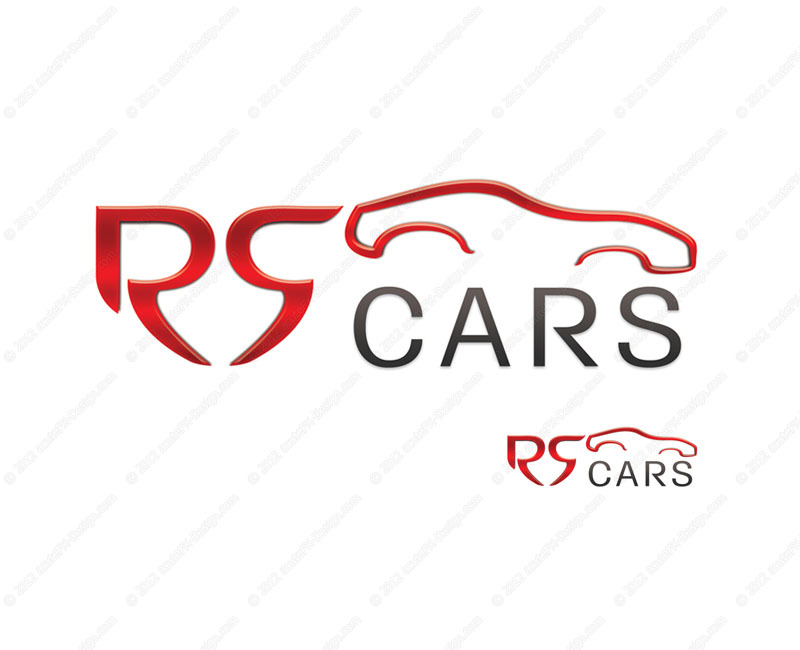 I will definitely be using their services in the future and have no hesitation in recommending them to others." 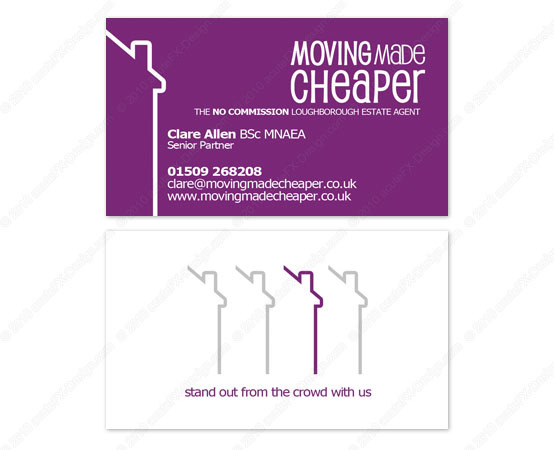 Clare and Jackie from Moving Made Cheaper wanted a business card that uses the same distinctive purple as their website, and one that includes a simple graphic on the reverse side. 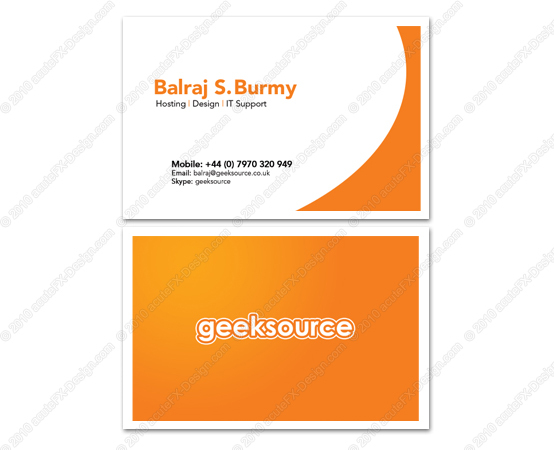 After several concepts, geeksource decided to go with the business card design with a white border. 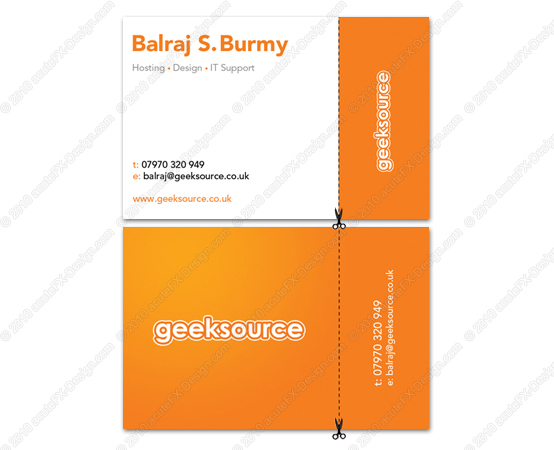 geeksource had their logo printed with a glossy accent while the rest of the card has a matt finish. 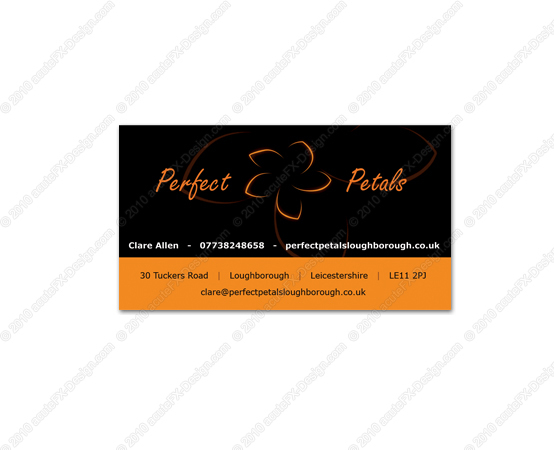 A sleek and simplistic business card design for a local florist. 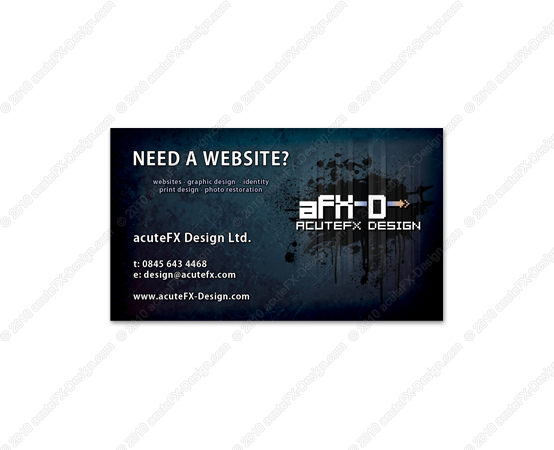 These are acuteFX Design's 2010 and 2008 business cards. 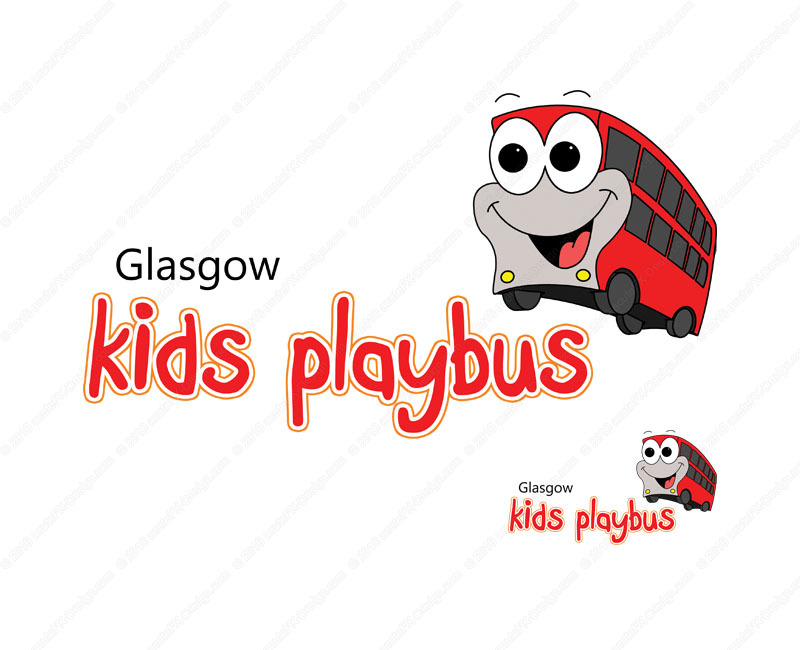 We wanted the designs to be simple and reflect the imagery used within our website. 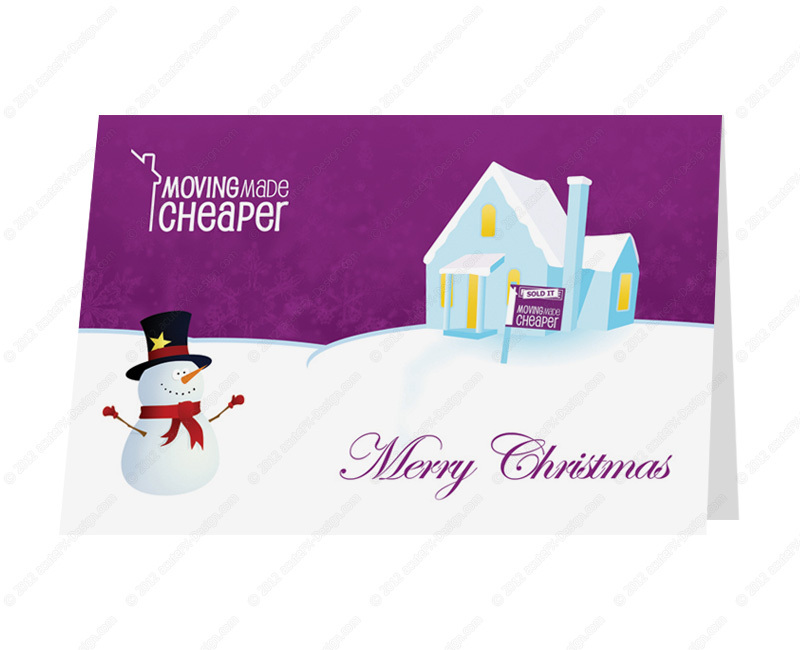 A Christmas card design made for Moving Made Cheaper estate agents in Loughborough. 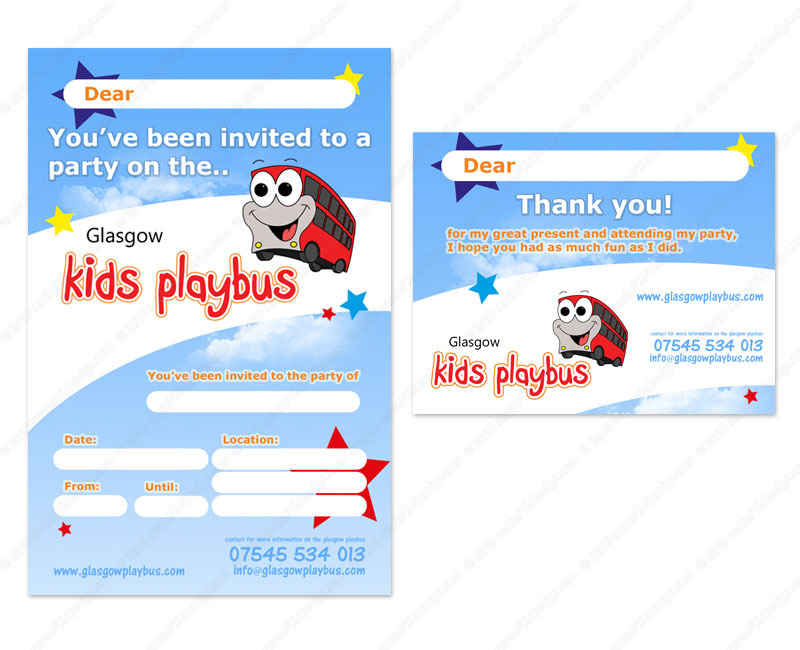 Glasgow Kids Playbus asked acuteFX Design to design party invitations and thank you cards that go with their new website. 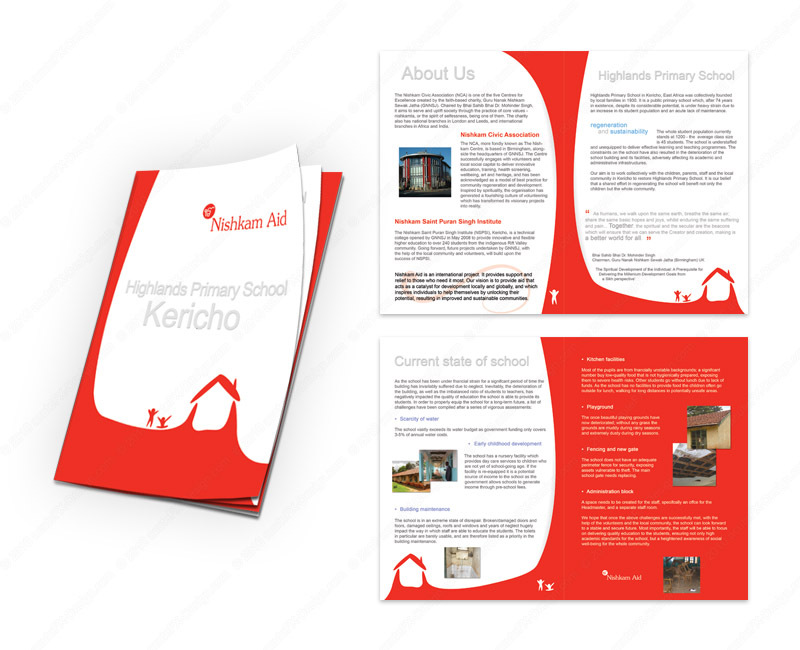 Nishkam Aid came to acuteFX Design looking for an 8 page leaflet for their restoration project at the Highlands Primary School in Kericho, East Africa. After a couple of concepts, we came up with the red theme sporting a small school house graphic which is repeated through the design. Gunjan needed a 4-page album cover, a 'CD on body' design and a CD tray / back cover design for her new album; Goonj: Echoes from Gunjan. acuteFX Design were given a few ideas and told that the colour scheme should work with the images provided. 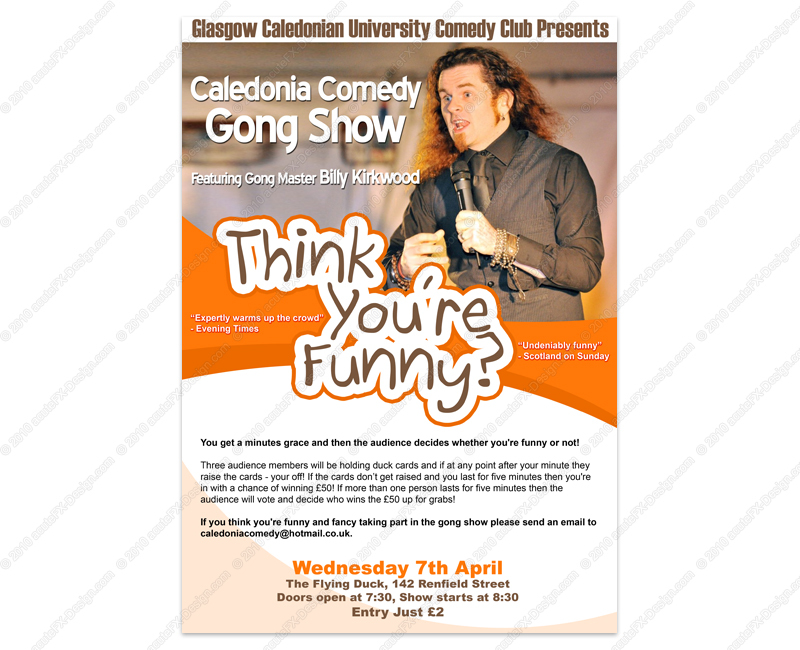 A poster design for a Comedy Show hosted at The Flying Duck in Glasgow. 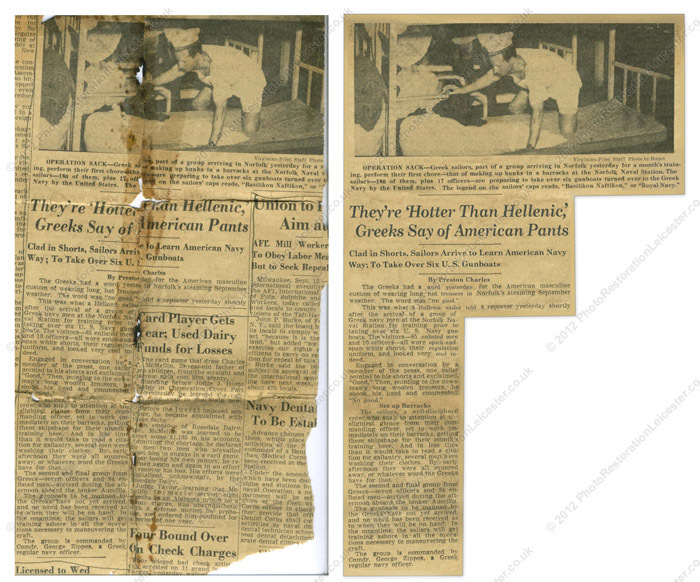 We were sent a high-res scan of a badly damaged newspaper article for repair, along with a few low-quality copies for reference. Nearly all of the paragraphs needed work to bring the image back to presentation level. 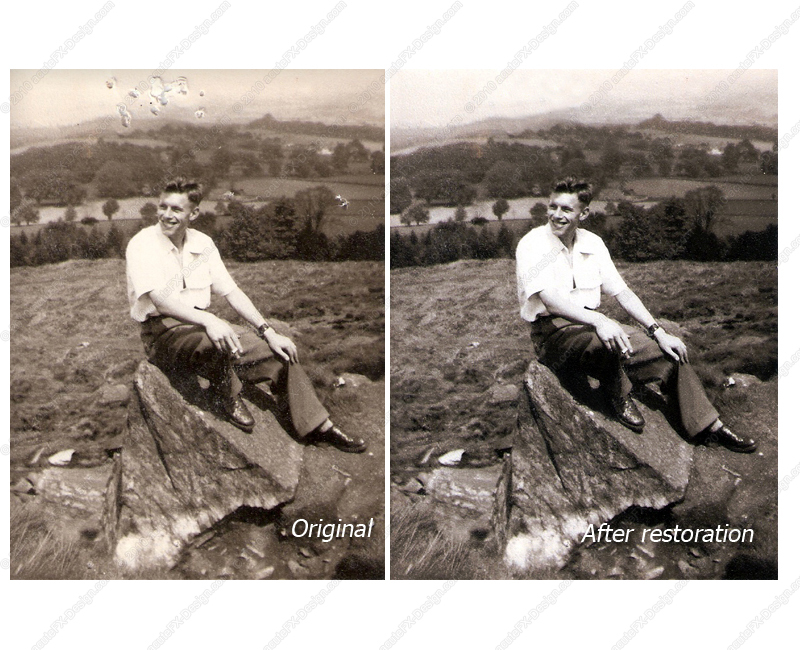 James Waugh sent this photograph to acuteFX Design for repair as it has been quite severely scratched over the years. It took over 6 hours to complete, but we managed to restore it to a presentable level. The photo is only a wallet-size photo, so our work had to be very delecate. 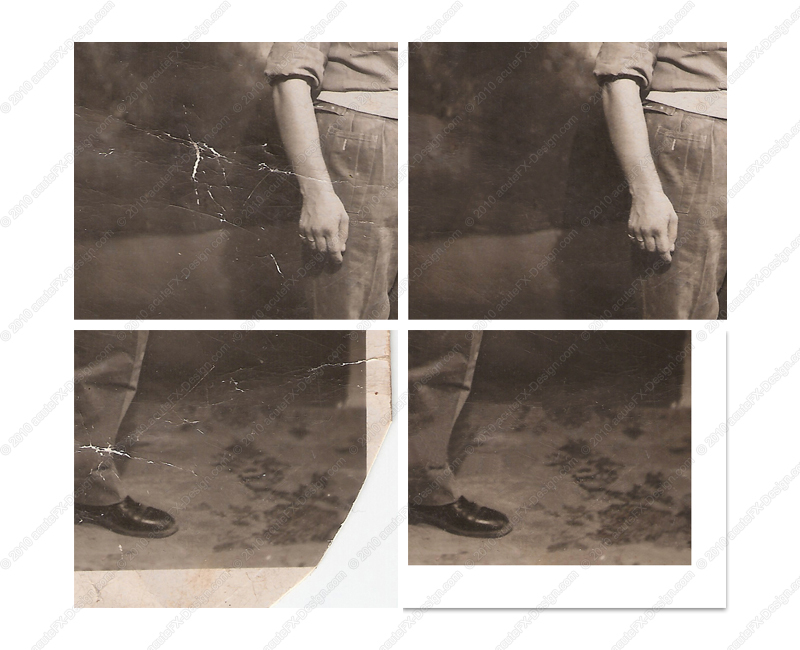 A treasured family picture came to us with rust damage, creases, staining and fading. acuteFX Design restored the picture by re-creating parts of the models face and hat and then removing all other stains and marks from the picture. "I haven't seen my father's face since I was a little girl - the work you've done is excellent!" This image had faded considerably after years on display. acuteFX Design enhanced the image's contrast and brightness to bring back lost detail. 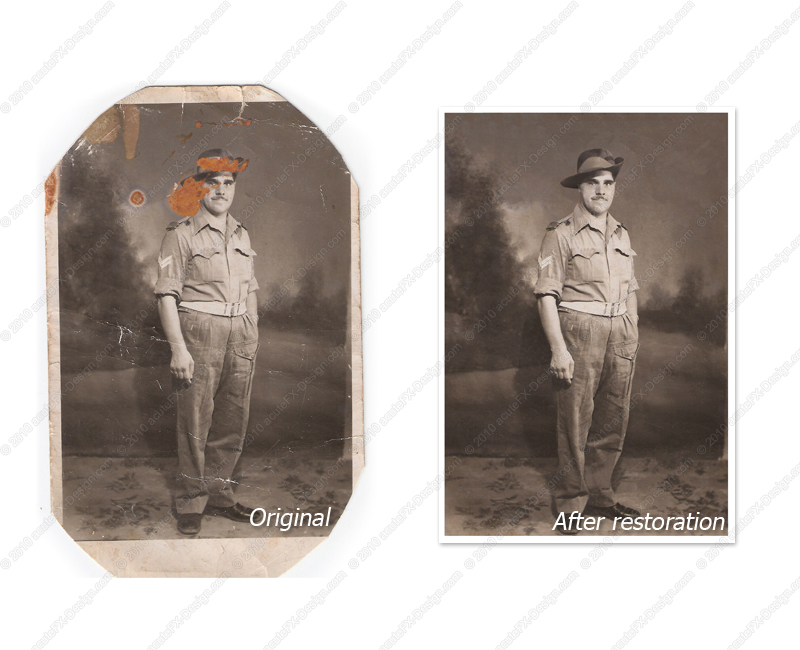 We then removed several stains and marks and cleaned up the picture's border. 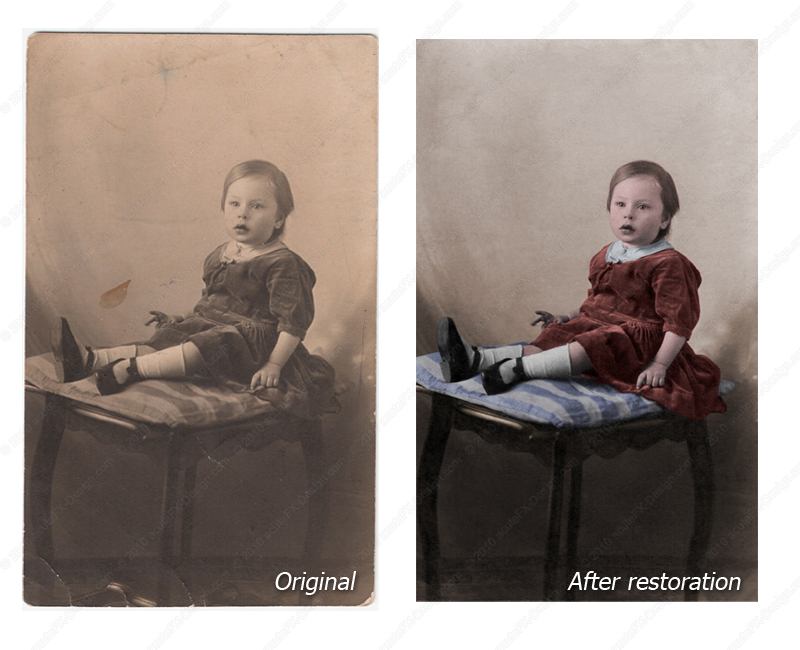 Once the restoration was complete, we coloured each section of the picture to create a great looking final piece. 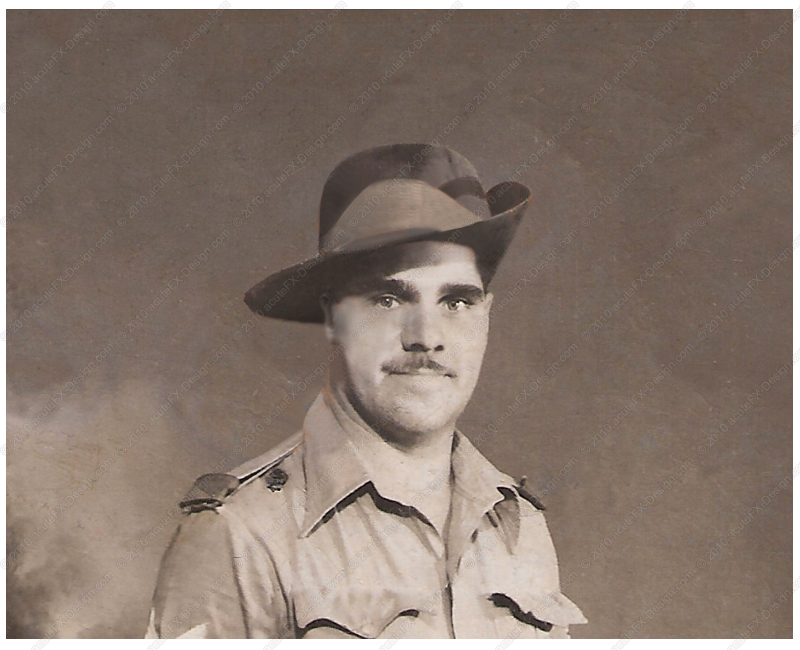 This picture of my late grandfather has been restored to its former glory. 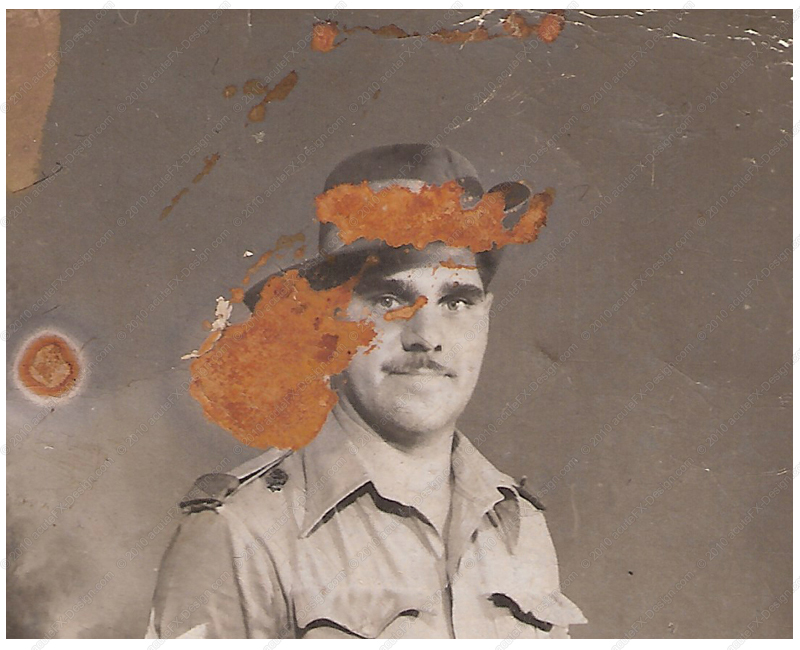 Holes on the photograph have been removed along with stains, fading and general 'wear and tear'. 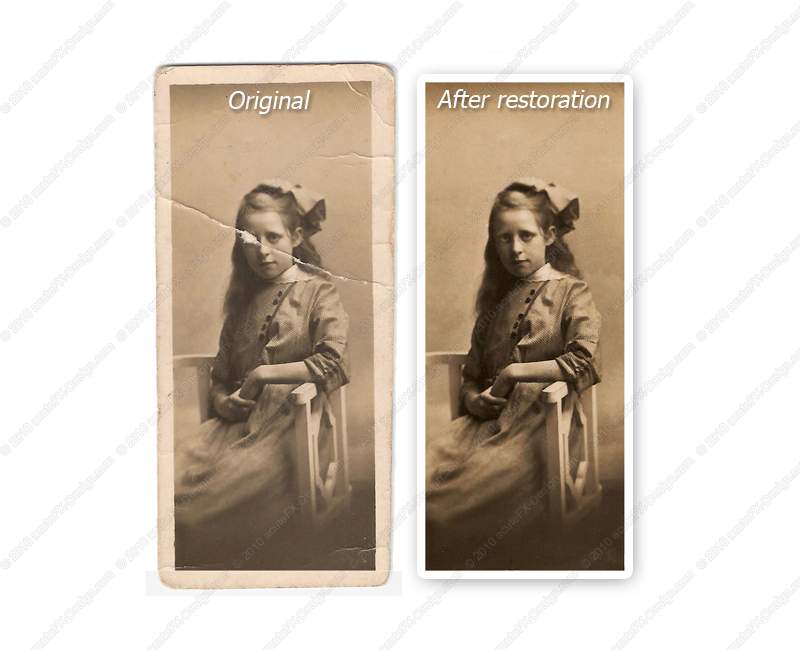 After general wear and tear, many pictures will develope small cracks and scratches. This picture unfortunatly had a crease right through the models face, but after a little work can now be displayed as if new again! 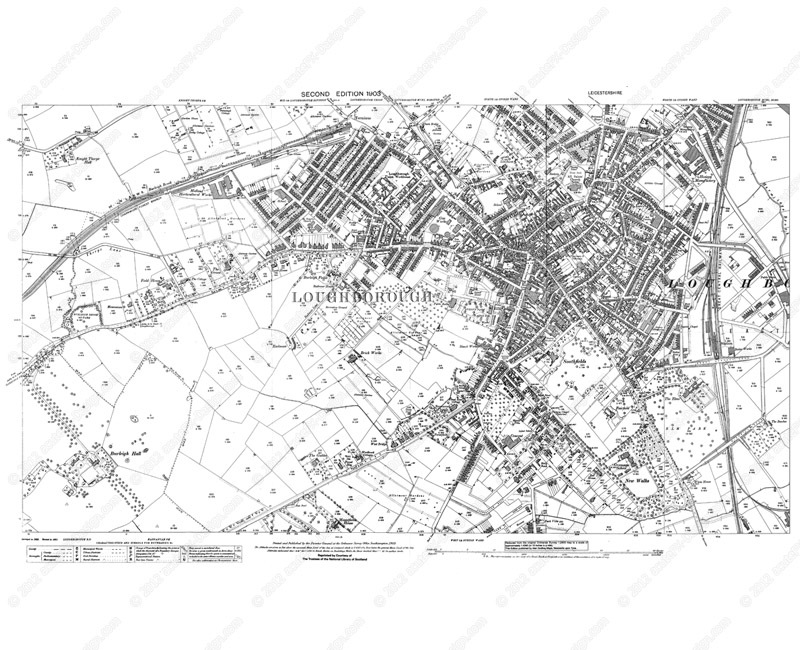 This old map of Loughborough was originally a very large (several feet square) paper map. With around 15 scans and a lot of editing, acuteFX Design managed to produce a high resolution, high-contrast digital copy of the map for print or reference material. 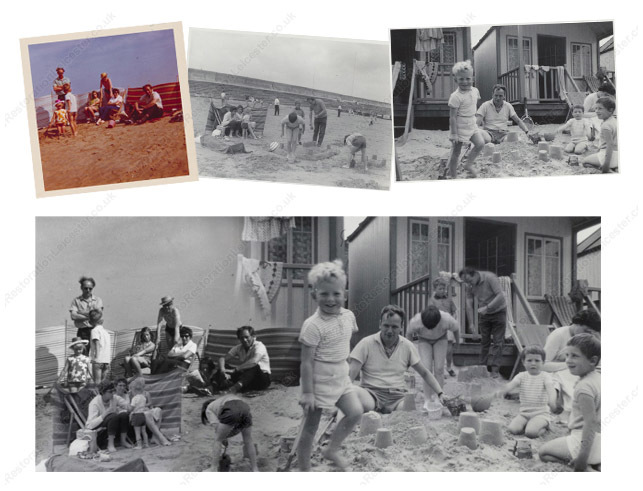 A client wanted three old family pictures to be combined into one as a gift. acuteFX Design combined the images in 'realistic' manner to create an end result that doesn't look like a steriotypical collage where the images are randomly placed on top of each other. 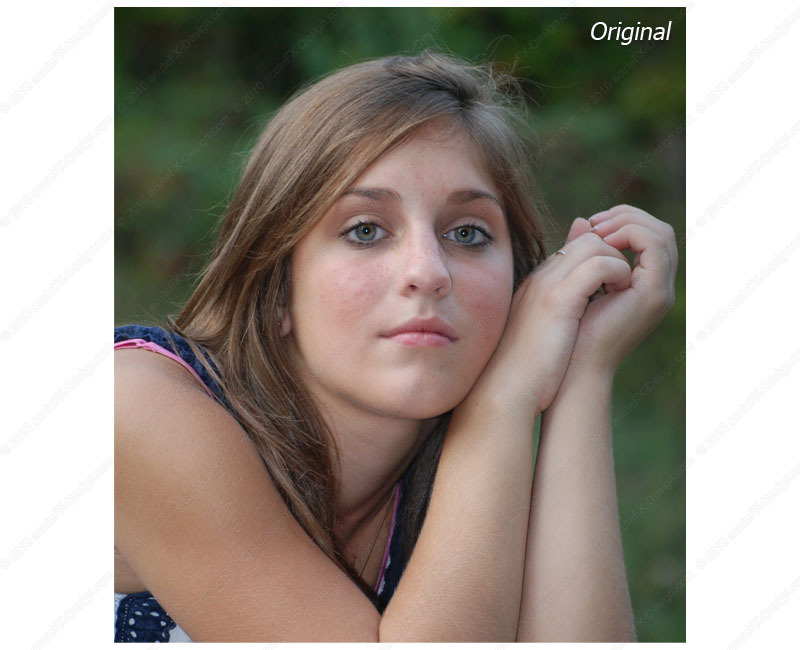 An example of our portrait Manipulation. The model's skin, hair and eyes have all been touched up, and her jaw line has also been edited. Original image taken by Miles Eliason. 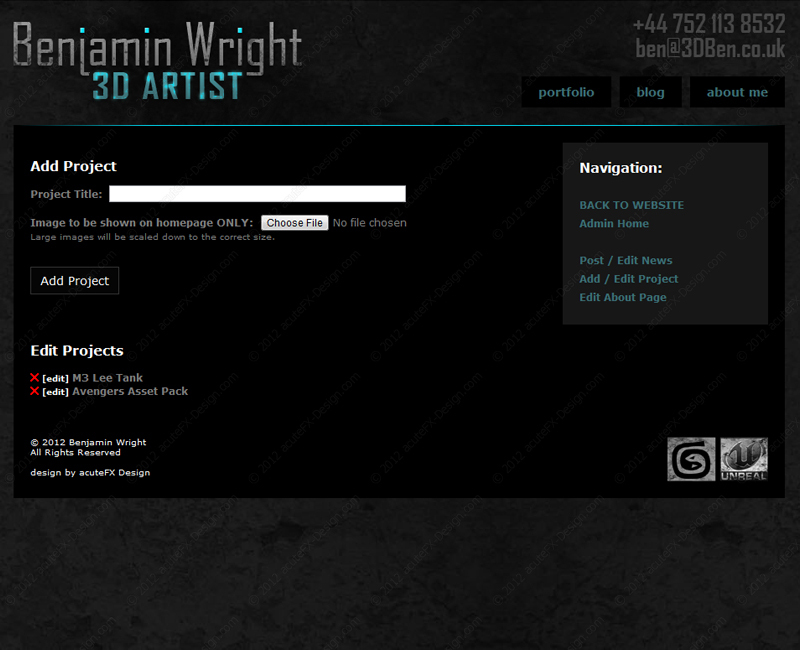 Using several images taken from Stock.XCHNG, we created this scene ideal for online or offline artwork. 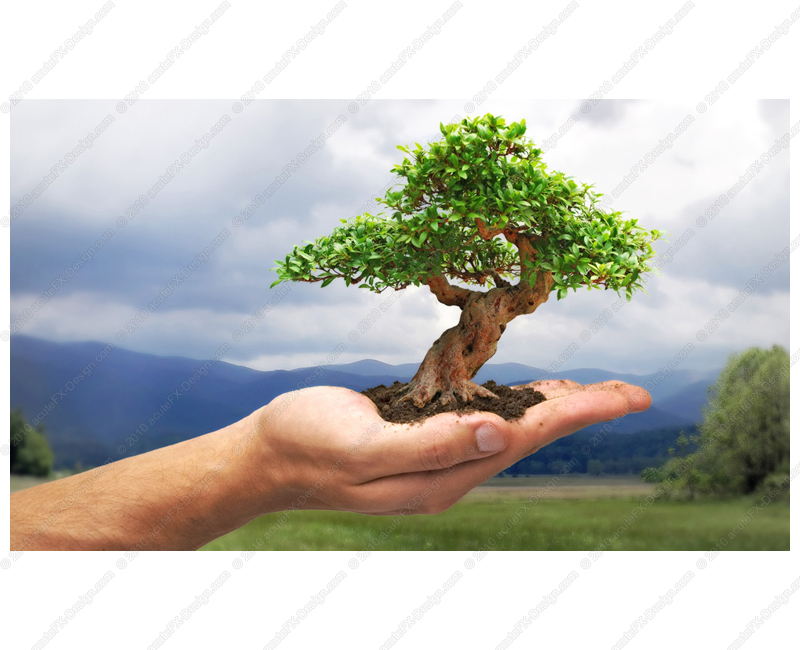 A total of three pictures were used; one of the background, one of the hand and one for the bonsai. 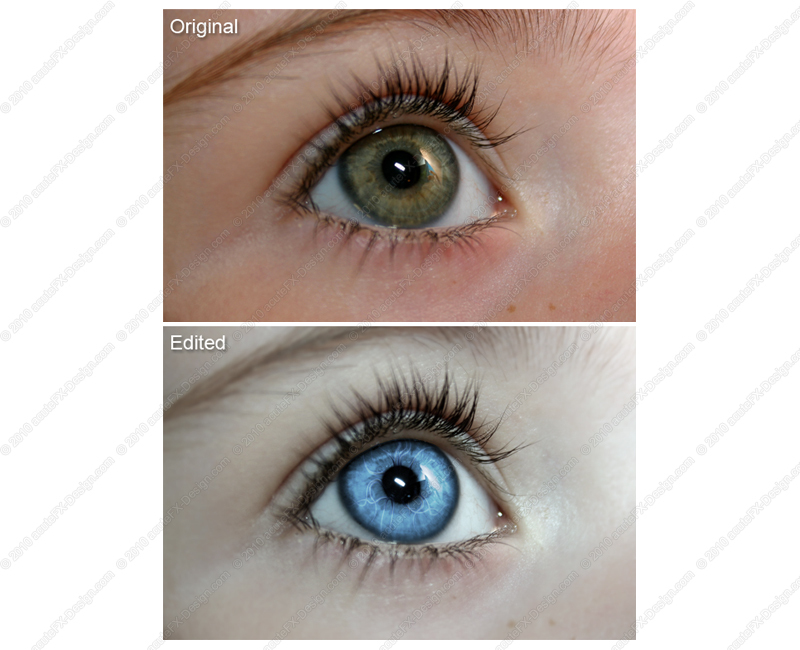 An example of our Photo Manipulation focusing primarily on colour and contrast changes. 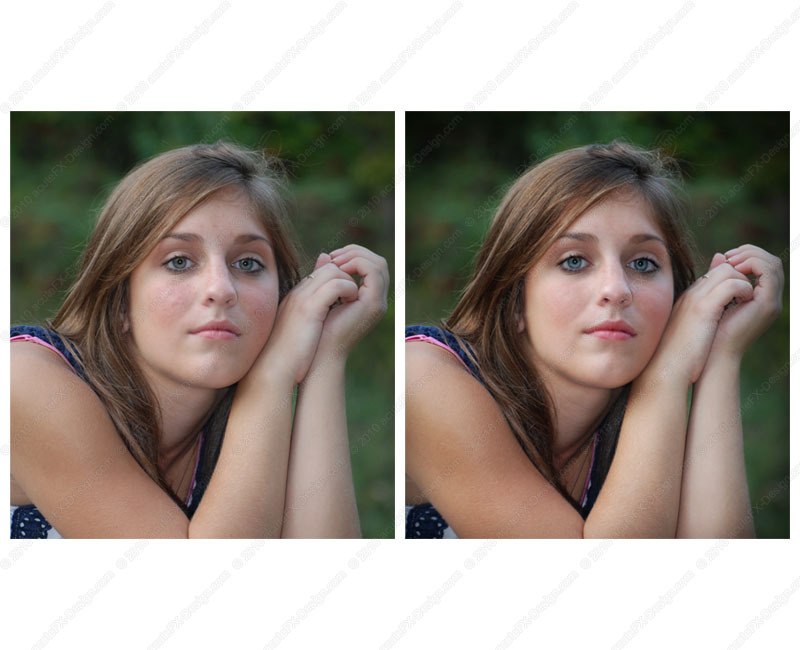 Changes like this could be either used subtly within portrait manipulation or to completely change a photograph into something with a little more fantacy. Original image taken from Stock.XCHNG. 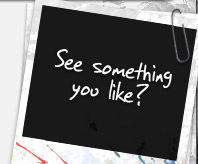 This simple image was made as an arty profile picture to be used on social networking websites.